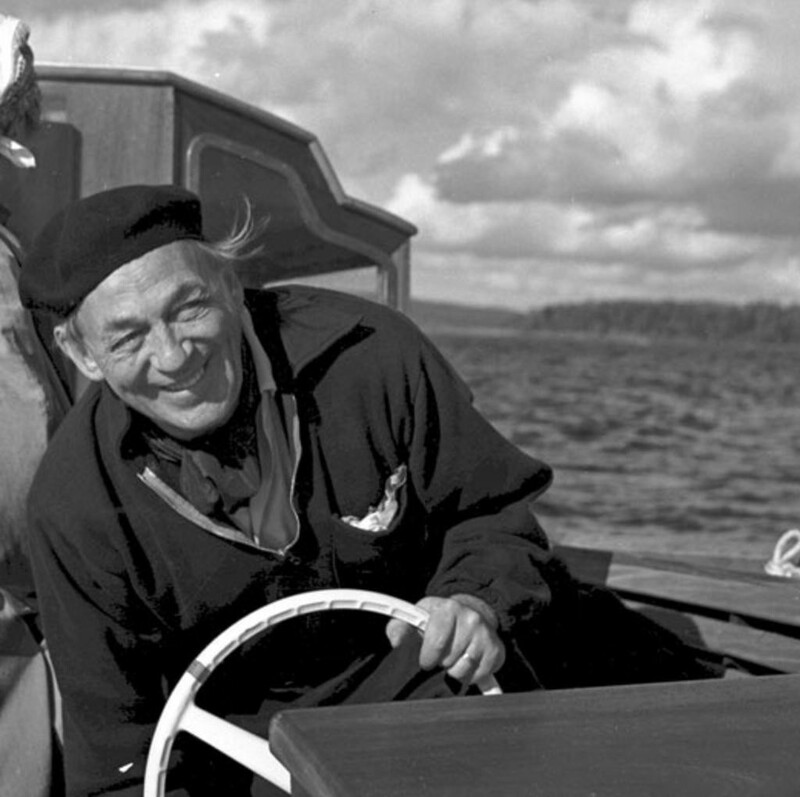 Alvar Aalto was born in Kuortane, Finland. He studied at the Jyväskylä Lyceum school, completing his basic education in 1916. He then enrolled in architecture at the Helsinki University of Technology, graduating in 1921. 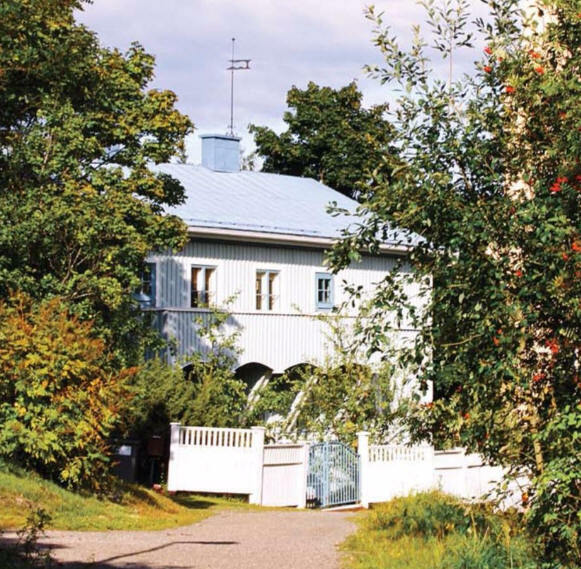 In 1923 he returned to Jyväskylä, where he opened his first architectural office. 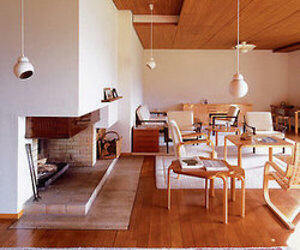 The following year he married architect Aino Marsio. 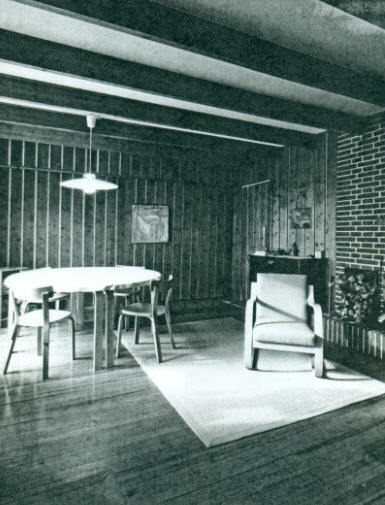 The Aaltos moved their office to Turku in 1927, and started collaborating with architect Erik Bryggman. The office moved again in 1933 to Helsinki. 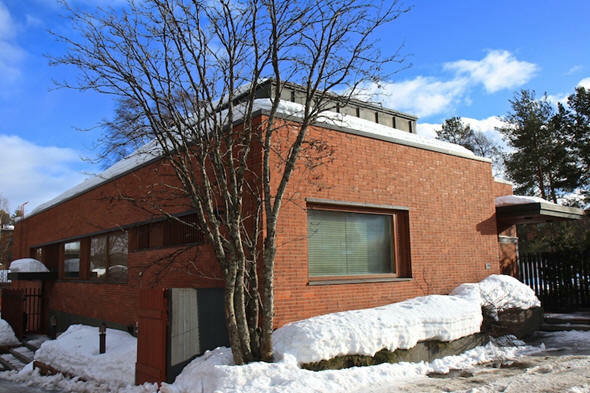 The Aaltos designed and built a joint home-office for themselves in Munkkiniemi, Helsinki, but later had a purpose-built office built in the same neighborhood - the latter building now housing the Alvar Aalto Academy. 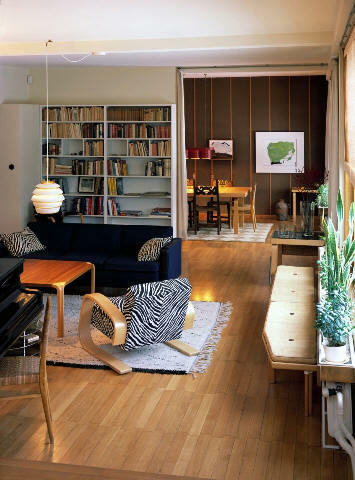 He is often regarded as the most influential architect of Nordic modernism. It was not until the completion of the Paimio Sanatorium (1929) and Viipuri Library (1935) that Aalto first achieved world attention in architecture. 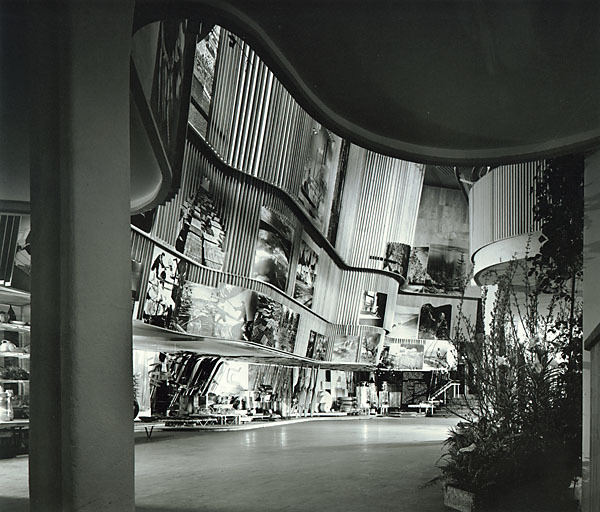 His reputation grew in the USA following his design of the Finnish Pavilion at the 1939 New York World's Fair, below, described by Frank Lloyd Wright as a "work of genius." Photo by Ezra Stoller. 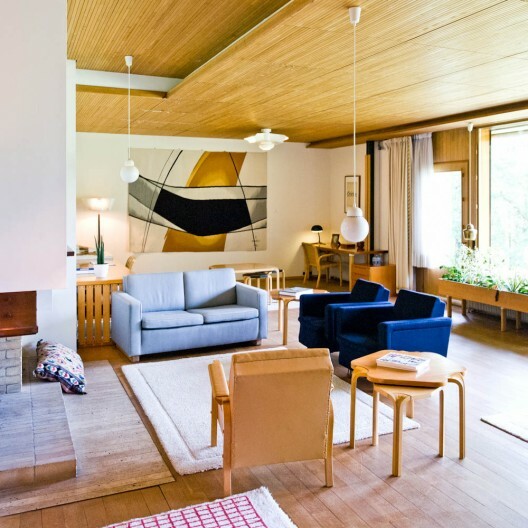 Aalto's early experiments with wood and his move away from pure Modernism happened with Villa Mairea (1939) in Noormarkku, the luxury home of Harry and Maire Gullichsen. 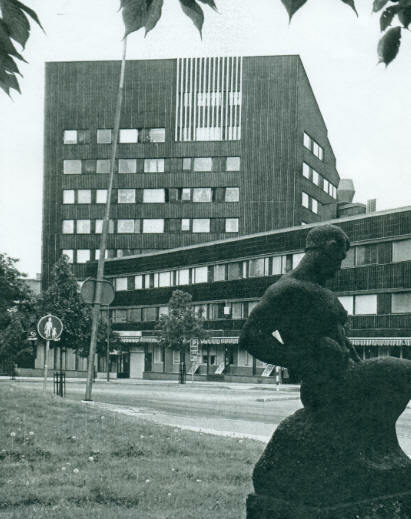 Aalto's early career runs in parallel with the rapid economic growth and industrialization of Finland. 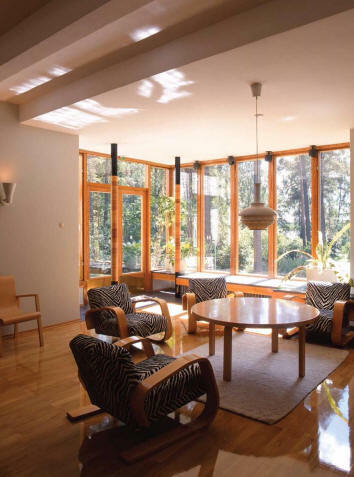 As did many well-known architects of that time, Aalto saw his designs as Gesamtkunstwerk, a total work of art, whereby he together with his first wife Aino Aalto would design not just the building, but the interior surfaces and often the furniture, lamps, and glassware. 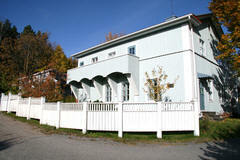 The Alvar Aalto Museum, designed by Aalto himself, is located in what is regarded as his home city of Jyväskylä. His increased fame led to offers and commissions outside Finland. In 1941 he accepted an invitation as a visiting professor to MIT where he involved his students in designing low-cost, small-scale housing for the reconstruction of war-torn Finland. He met Frank Lloyd Wright in 1945 at a special "summit luncheon at the Manhattan Club in New York City. While teaching at MIT, Aalto also designed the student dormitory, Baker House, completed in 1948. 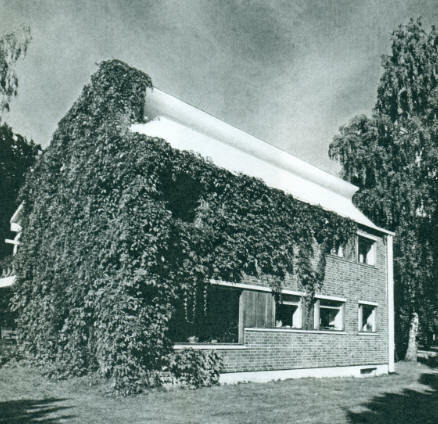 This building was the first building of Aalto's red brick period. 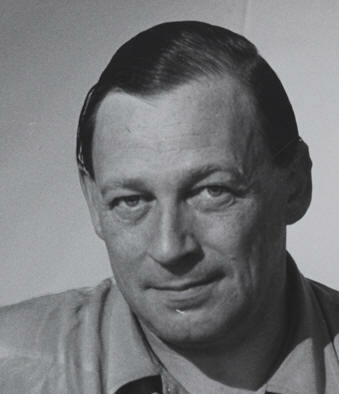 Aalto's awards included the Royal Gold Medal for Architecture from the Royal Institute of British Architects (1957) and the Gold Medal from the American Institute of Architects (1963). He was elected a Foreign Honorary Member of the American Academy of Arts and Sciences in 1957. Aalto's 'High Stool' and 'Stool E60' manufactured by Artek were used in Apple stores across the world as customer seating. Biography adapted from Wikipedia. Special thanks to volunteers Catherine Westergaard Cramer and Daniel Perrin for research. Around 1919 - Herrenas Manor, a training assignment at the Institute of Technology, Finland. The plan comprises a main building, outbuilding, stables, a cowhouse with its pile of manure, and labor housing. A symmetrical plan, with narrow staircases and corridors, and a monotonous facade with a central pediment and tall pilasters in diluted Neo-Classical style. Unbuilt. 1919 - Row House in Toolo District, Helsinki, Finland, probably a training assignment at the Institute of Technology. This was a brick house consisting of four identical, almost cubic blocks in two stories, each with a main entrance, hall, living room, dining room, serving room and kitchen with separate entrance on the ground floor, and a hall, four bedrooms, and a bathroom upstairs. Unbuilt. 1919 - aka Mammula, Alajarvi, Finland. Commissioned 1918. 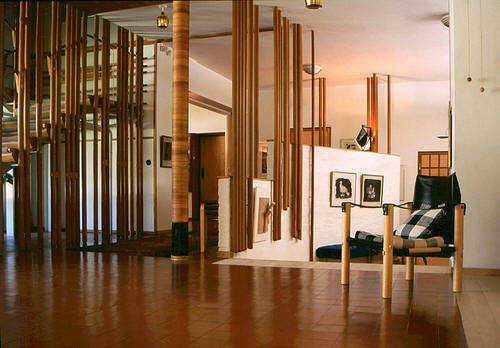 This house belonged to Aalto's parents and he completely rearranged it. Destroyed in the 1950s. The drawings have disappeared. 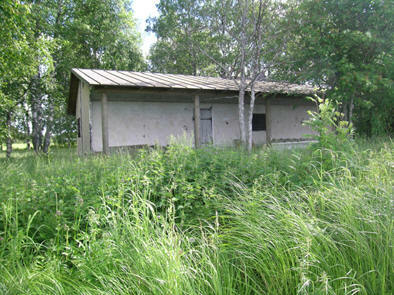 1920 - Renovation of Myllykangas Farm, Alajarvi, Finland. 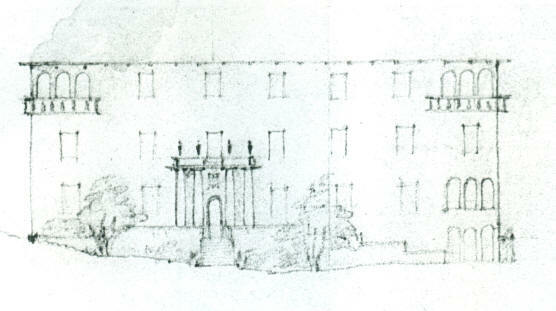 The most important inroad made on the old main building was a redisposition of the portico and entrance with columns and pilasters, which were outwardly symmetrical, but permitted a highly functional asymmetrical design for the internal communications on the ground floor (hall, living room and five other rooms) and for the two, two-room flats on the upper floor, each with a staircase of its own. The building has the character of a refined Gustavian (late 18th century) farmhouse. 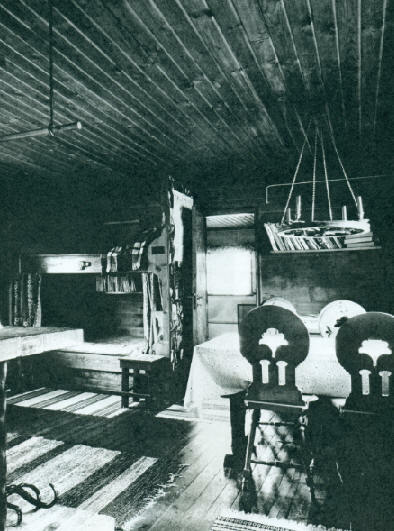 1922 - The Nuora House Renovation, Hongikontie 9, Jyvaskyla, Finland. 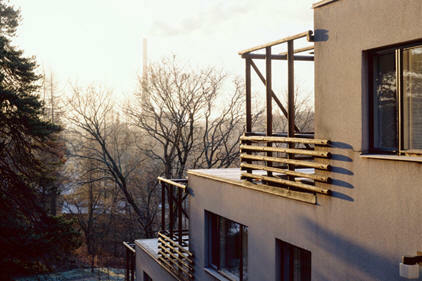 Aalto redesigned it into a two-story residential and commercial building. The lower level was a bakery and cafe while the second story included three flats reached by an internal staircase and an access balcony. The building became entirely residential. 1923 - The V. Heikkila House, Lapua, Finland. Unbuilt. The elevations show a wooden two-story residential building with a pitched roof. The two entrances and the central window are flanked by unusual engaged columns. The two stories are connected by four pilasters, and the walls are sided with vertical weatherboarding. 1923 - The Terho Manner House, Toysa, Finland. 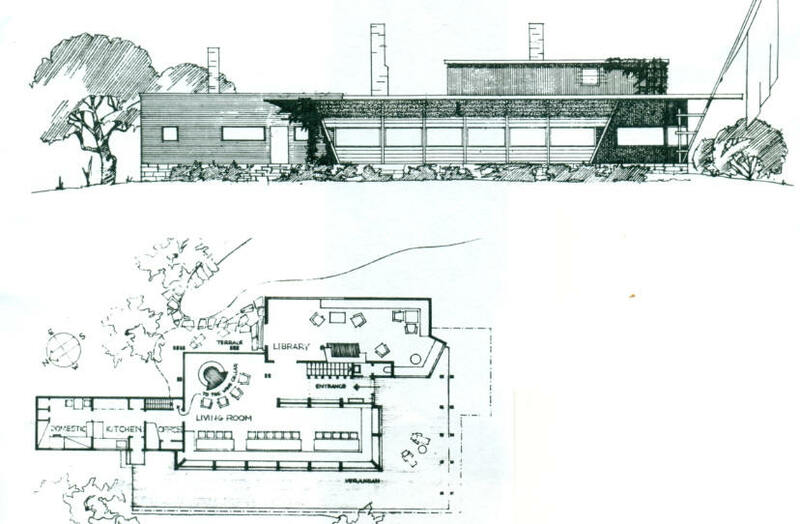 Aalto received this assignment from his mother's cousin, Terho Manner, for a manor-like complex near Lake Ponnejarvi. From the main entrance, a monumental stairway divided by garden terraces leads down to the lake. The lakeside buildings have been demolished while the rest are well preserved. 1923 - The H. Heinonen Commercial and Residential Building, Jyvaskyla, Finland. A two-story stone townhouse with a monumental, centrally placed entrance niche, with access to the shop interior and the dwelling on the upper floor. Unbuilt. 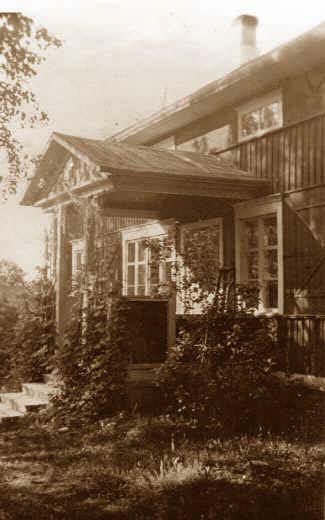 1923 - The Chief Constable Karpio's Summer Villa Renovation, Lehtisenkuja 1, Jyvaskyla, Finland. 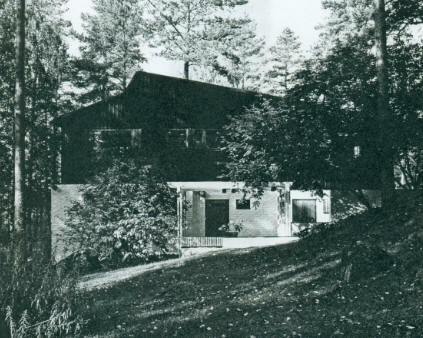 Aalto's original plan involved sweeping changes: it featured a central hall to permit a two-story extension of the building on the steeply sloping plot. It even had a garage. The renovation was carried out in considerably reduced form in a single story. 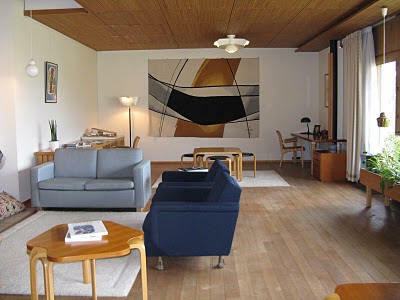 Deeded to the Alvar Aalto Museum. Photo from 1979. 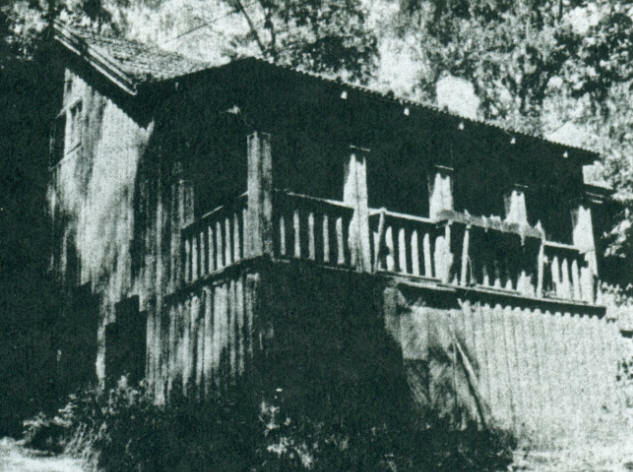 1924 - House for Alatalo Farm, Oksalankuja 1, Tarvaala, Laukaa, Finland. 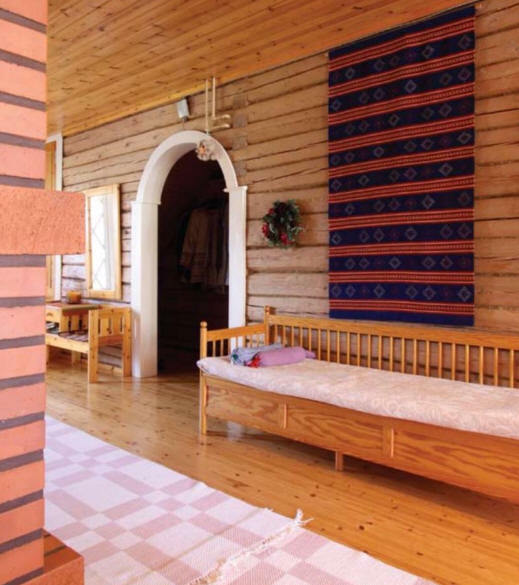 Recently restored, the house is a two-story log villa with symmetrically composed facades and a hip roof. A hall containing a huge fireplace runs thourgh the building, connecting the closed porch at the front with the verandah on the garden side. 1926 - The Railway Officials Block of Flats, aka the Aira Apartment Building, Tapionkatu 2, Jyvaskyla, Finland. The 3-story brick building contains 18 identical flats, comprising two rooms, a kitchen, bathroom, and hall, grouped around three stairways, entered from the courtyard which was planned as a garden. Around 1924 - The Nuora House, Jykaskyla, Finland. Wooden house which originally contained a baker's shop and cafe on the lower floor and three dwellings of one room and a kitchen upstairs. The house was built, and still stands facing the Taulumaki Church. It has an unusual balcony leading to a staircase inside. Around 1924 - The Emil Vekara Summer Villa, Karstula, Finland. 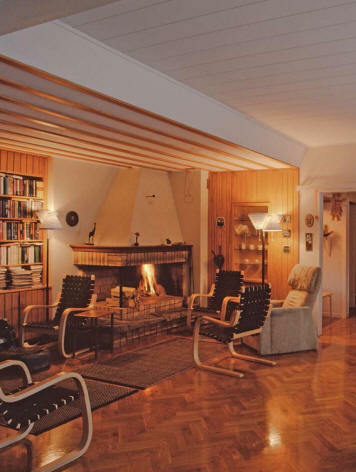 His first summer house, Aalto designed an exquisite miniature log cabin with a porch, kitchen, and living room on the ground floor and two tiny bedrooms in the attic, heated evenly in the winter by stoves grouped around a chimney wall. 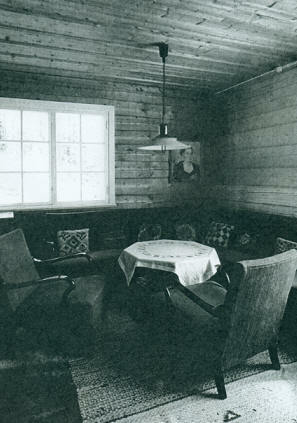 Around 1925 - Railway Inspector Tuurala's Villa, Kintaus, Finland. 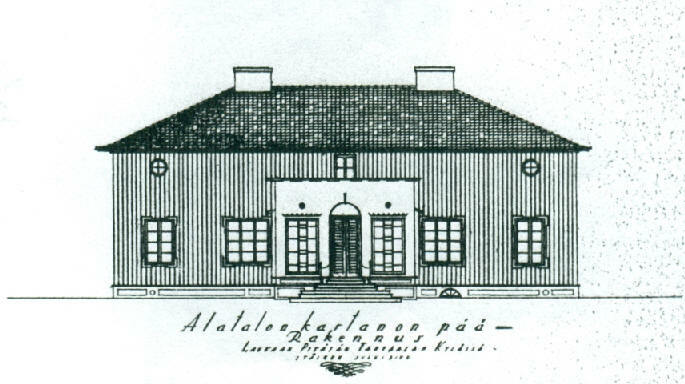 This stately villa with Palladian touches was built on an island in a lake north of Kintaus railway station. Destroyed by fire in the 1930s. It comprised eight rooms and a kitchen, in two stories under a mansard roof. The predominant element was a magnificent verandah with a flat roof supported on eight double columns. The verandah roof formed a balcony in front of a huge semicircular window in the top story. 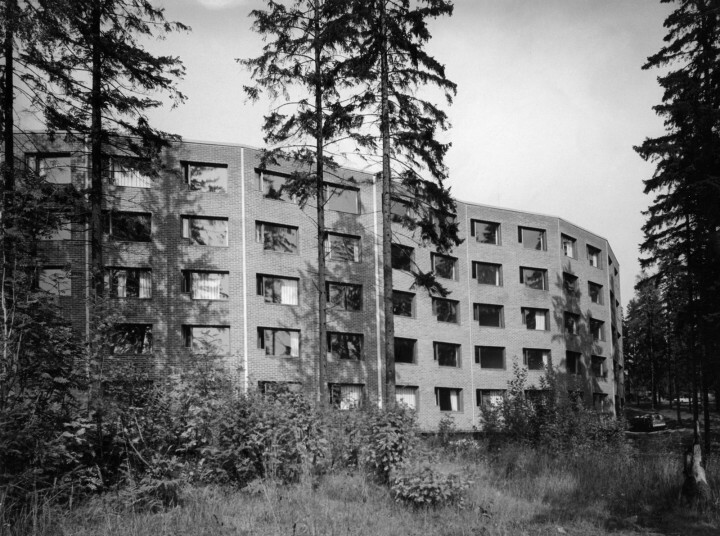 1925 - Block of Flats for 'Mendelin Site', Jyvaskyla, Finland. Unbuilt. Plan for a commercial block of rented flats, with four stairways, a couple of dozen flats, shop premises at street level and a cinema for 192 spectators in the basement. Facade with regular rows of windows, rendered surface, and horizontal moldings between the stories. 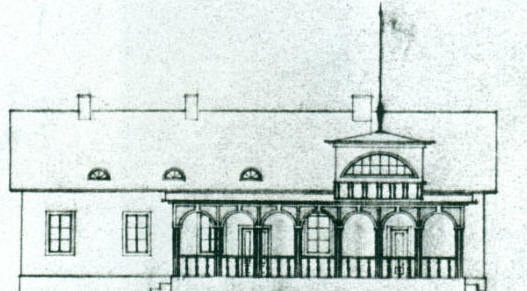 High chimney resembling a campanile, loggia on the roof, and balcony with Palladian window on the third floor. 1928 - aka Casa Lauren, Vapaudenkatu 12, Jyvaskyla, Finland. Commissioned 1925. 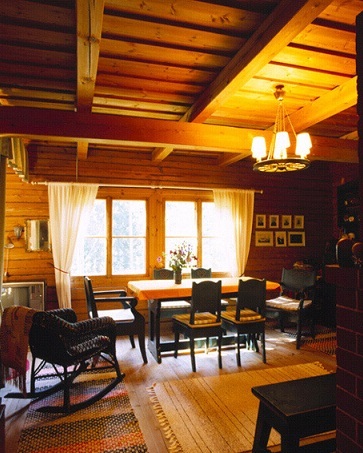 Wooden two-family house, completely altered in the 1950s to office use. Around 1925 - One-Family House, unknown location. Judging by the inscription, this was a competition entry. A simple wooden type building with a total residential floor area of approximately 625 square feet, comprising a large dining room-kitchen with a baking oven, a bedroom, clothes cupboard and porch, a simple pitched roof and a symmetrical facade with a Classicizing doorway in the middle. 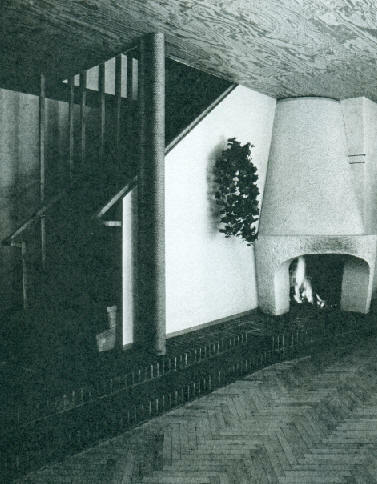 1925 - The Vaino Aalto House, aka the Atrium House. Unbuilt. 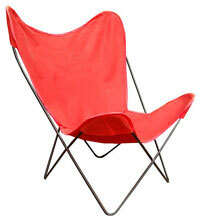 Aalto designed it for his brother Vaino who thought it too expensive. There was a courtyard in the middle of the cubic building, covered for weather reasons. 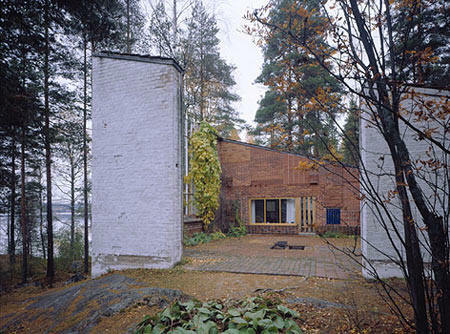 1926 - The Vaino Aalto House, aka Villa Väinöla, Alajärvi, Finland. A simplified version of the Atrium House. Here the atrium disappeared, otherwise the room arrangement remained basically the same. The arcade on the garden side shrank to a high temple-like porch flanked by two columns. The present building has been extended by one room on one side and a loosely connected shed on the other. 1926 - The Ollila Farm, Main Building, near Jyvaskyla, Finland. A discreetly classical wooden farmhouse of villa character. Was in such bad repair by 1984 that it was demolished. 1926 - The Three-Story Luxury Apartment House, location unknown. The house, for which complete plans were drafted but which were probably never built, contains one larger and one smaller luxury flat on each floor, and has central heating but no elevator. 1926 - Renovation of Wooden House, corner of Vapaudenkatu and Vaasankatu, Jyvaskyla, Finland. Later demolished. 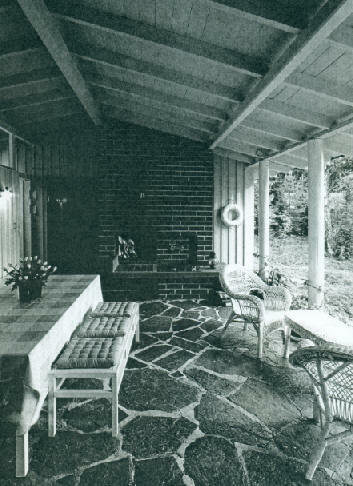 1926 - The Alvar and Aino Aalto Summer Cottage, aka Villa Flora, near the village of Alajarvi, Finland. Designed by Aino. Low wooden stuccoed single-story wing with an originally sod-covered pitched roof and a colonnade all along the long wall facing the lake. Contains kitchen, living room, and bedroom. 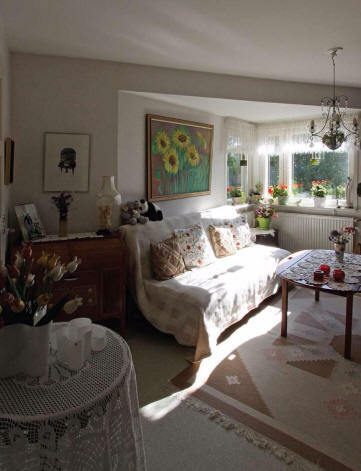 In 1938, an extension was built, consisting of two bedrooms. 1926-27? - Town Plan for Sammallahti Industrial Estate in Jamsa Municipality, Finland. Aalto's first preserved town plan. It groups the residential, service, and administrative buildings around the existing factory buildings. The functions are divided into various zones with easy access to a natural park and surrounding recreation areas. The following types of housing are indicated: five four-family houses with two-room flats, fifteen two-family houses with their own gardens, divided among three different zones, allotment gardens for all families without a house garden, two large buildings for unmarried workers, and two separate one-family houses for foremen. Huge multi-story sheds and storehouses. Unbuilt. 1926 - Town Plan for Keuruu, Finland. 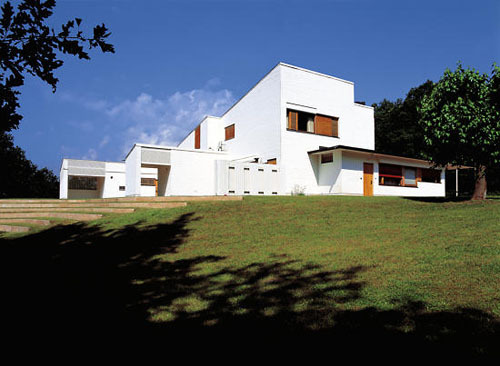 Aalto took great pains over this commission and even received a fee for it, but his plan was never carried out. The drawings have disappeared. Around 1927 - Three-Story Residential and Commercial Building for unknown site. Simple corner block of rented flats, with shops on the ground floor, four luxury flats with a tiny servant's room and a windowless columned hall in the middle. Probably unbuilt. 1927 - Employee Housing for the Wilhelm Schaumann Company, Joensuu Plywood Mill, Finland. Built. Well-preserved. A symmetrical rendered two-story building containing two flats, both of them running through both levels. In addition to a kitchen and amenities, one contains four rooms, the other six. Do you have a current photo? 1929 - Standard Apartment Block, aka the Tapani Building, Lantinen Pitkakatu 20, Turku, Finland. 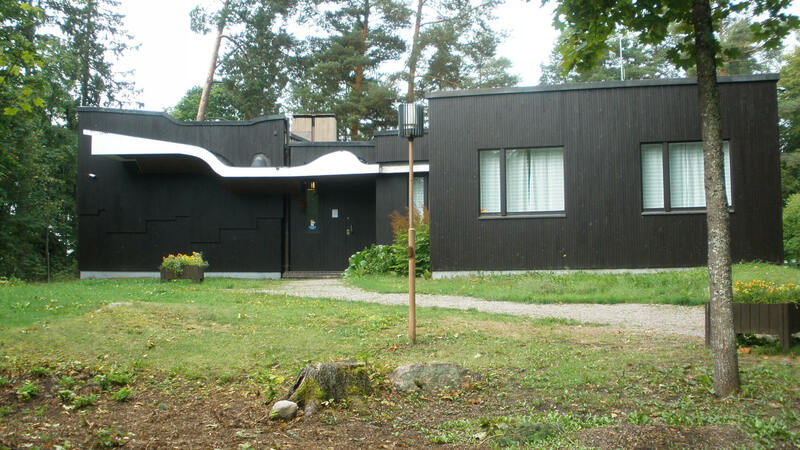 Aalto's interest in International Rationalism, which the Kinkomaa plan had already hinted at, blossomed forth. Commissioned 1927 by the Tapani construction firm, which manufactured standard precast concrete units: beams of standard 50 cm width and wall units one foot thick; all hollow in order to facilitate installation of pipes, air ducts and electricity wires. 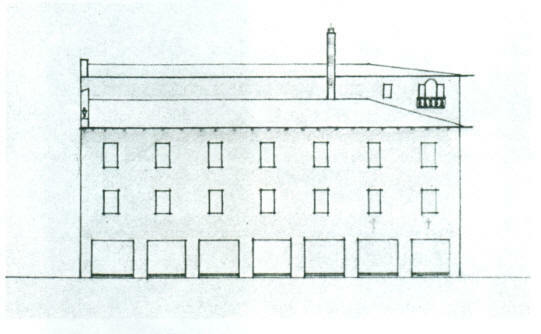 The six-story building has shops on street level and one-roomers to three-room flats with a kitchen and servants' room. 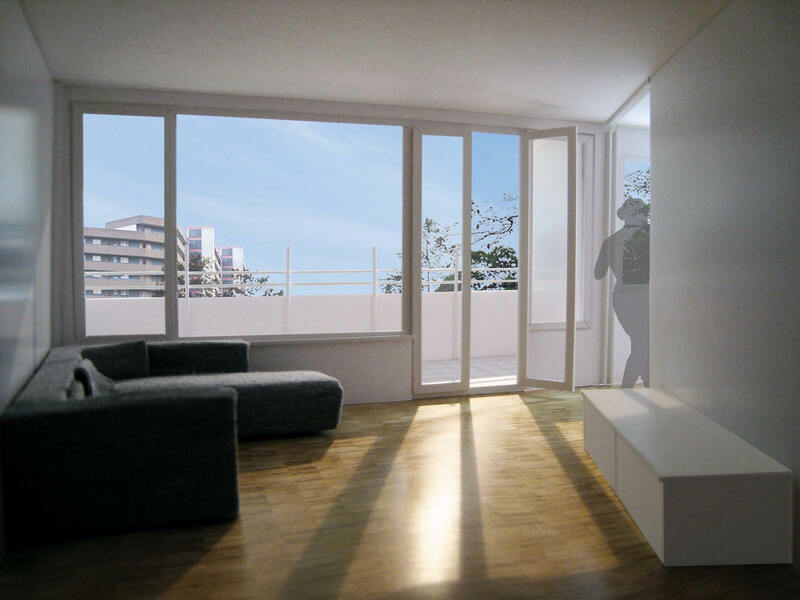 Some of the facilities contain a living room which can be partitioned in various ways. 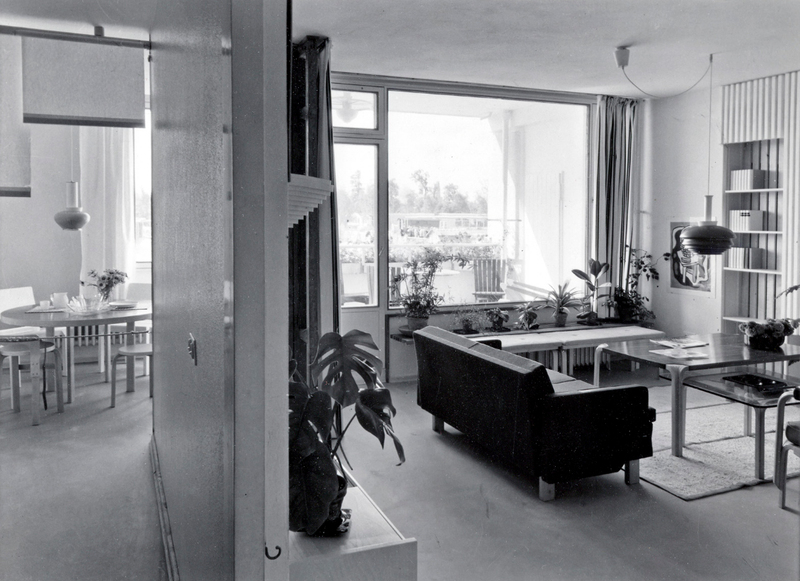 Aalto furnished some of the flats with high-quality standard furniture, which was exhibited to the public. 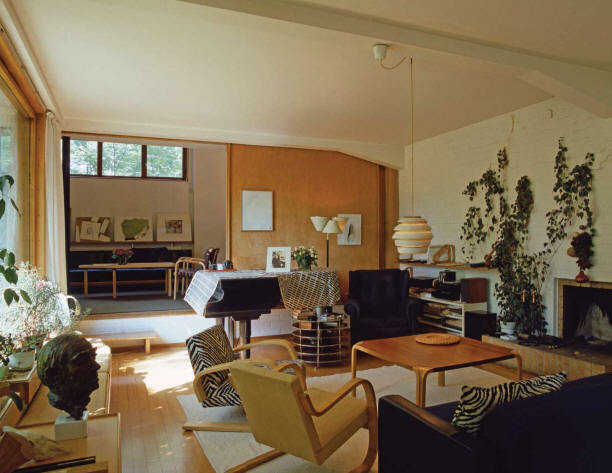 Some was made by the Tonet company, some specially designed by Aino Aalto. 1928 - Three Summer and Weekend Cottages for the Aitta Magazine Competition. Aalto won 1st prize in both categories with "Merry Go Round" and "Konsol." The third, "Kumeli," did not win but gained him a client. Some examples of "Merry Go Round" have been built. One is in Saynatsalo, altered later so that it could be lived in during the winter. 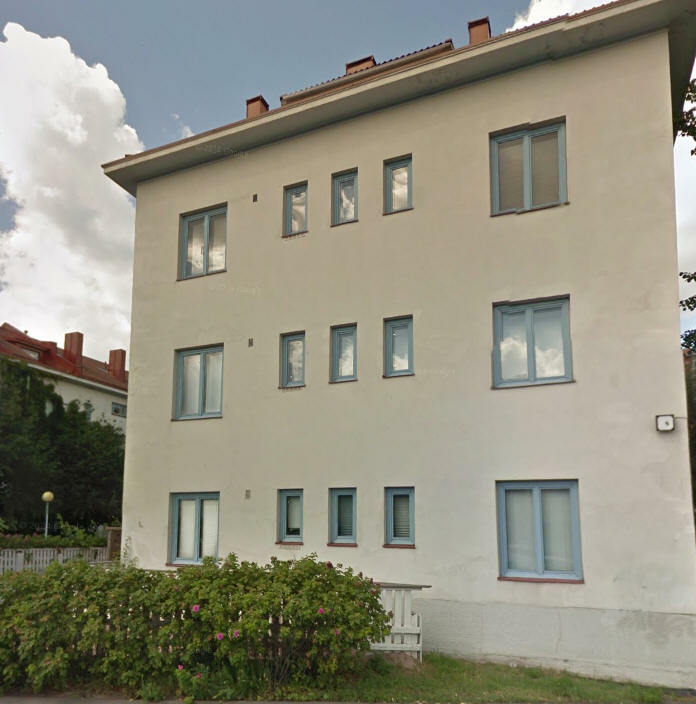 1928 - Block of Flats at Uudenmaakatu 6, Turku, Finland. 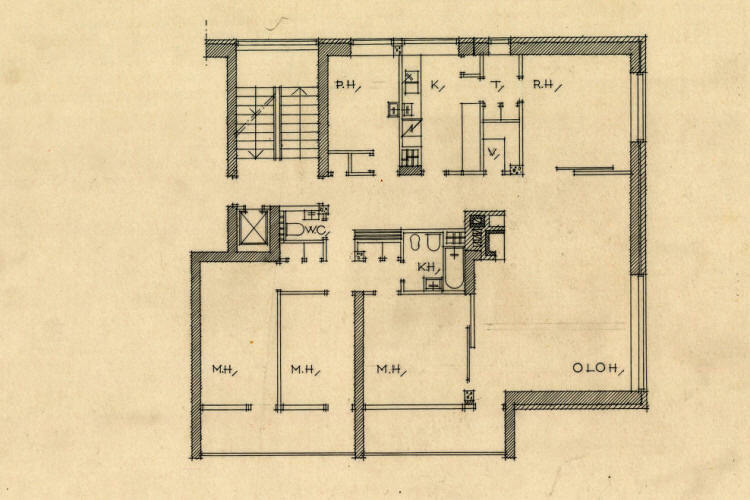 Arvo Ketonen, owner of Turun Sanomat, commissioned the drawings for a block of rented flats and shops from Aalto in May, 1928. 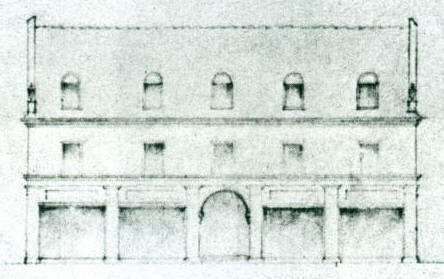 His plan comprised seven shops at street level and 42 flats (from 1-4 rooms) on the six upper stories. The depression which paralyzed the construction business in Finland in 1929 prevented implementation of the project. 1928 - The Ilmari Katajas Renovation, Tuureporinkatu 3, Turku, Finland. New bathroom, a kitchen with specially designed cupboards, and several new doors and windows for the 8 rooms. 1930 - The Minimum Apartment Exhibition. Aalto was the initiator and chief arranger of this publicity event for social housing. The idea of the exhibition was borrowed from the similar CIAM exhibition in Frankfurt the preceding winter. 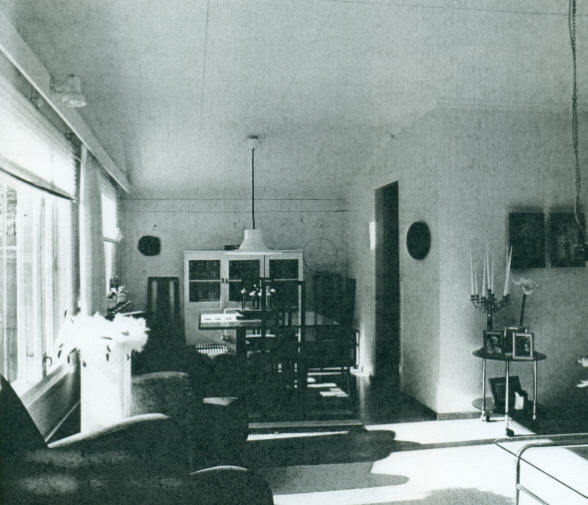 Aalto was responsible for the complete furnishing of a bedroom and a living room with a dining alcove, while wife Aino furnished a minimum kitchen. 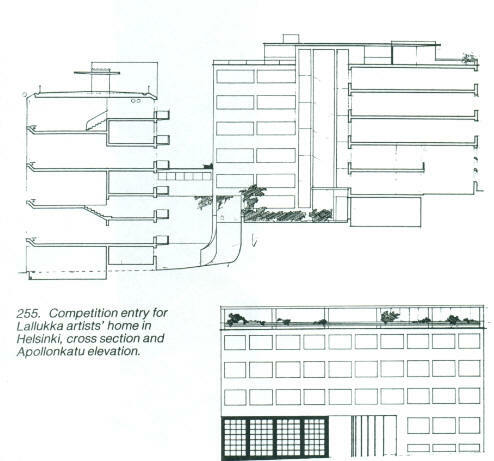 1931 - Competition Entry for Lallukka Artists' Home, Helsinki, Finland. Aalto took part with 3 entries, 'Lucca' and 'The Bees'. His main entry 'Lucca' shows 2 building volumes, one with ordinary flats facing Apollonkatu, the other with studios facing Hesperiankatu, and linked by corridor bridges crossing an open planted courtyard, in addition to which the buildings have roof gardens. The studios are two stories high and have a gallery loft. The five stories of the studio building are interwoven in a highly intricate way, making all of the apartments different, partly because they go either upward or downward from the 8 separate entrance levels. 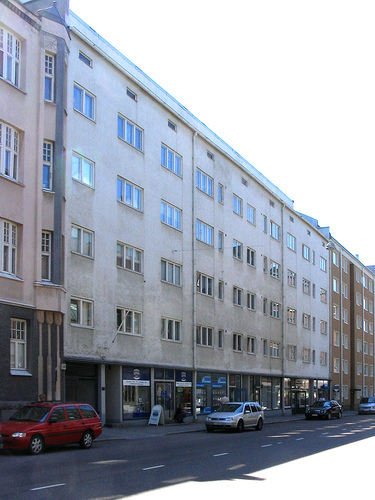 Aalto's entry was rejected by the jury because he exceeded the stipulated 4 stories on the Apollonkatu side and placed the studio windows in the short walls of the rooms. Unbuilt. 1931 - Plan for a Dock Workers Housing Block in Kotka, Finland. 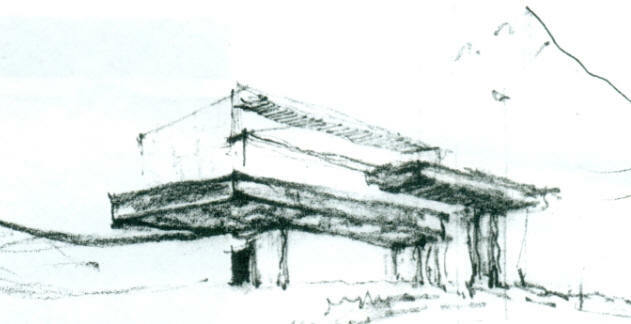 The Kotka dock workers federation commissioned sketches from Aalto. Unbuilt. Early 1930s - Hunting Lodge for an unknown client. 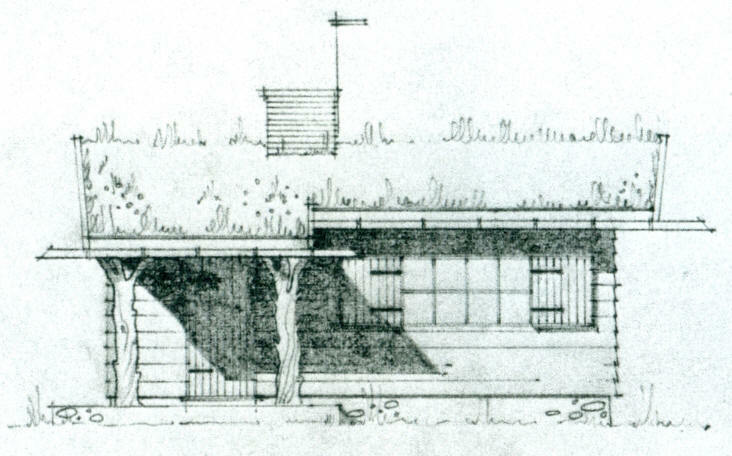 Undated drawings in the Aalto archives show a semi-Functionalist single-story wooden cottage with a verandah-type porch at both ends. At one end is a large living room in farmhouse style, at the other two bedrooms, between them a kitchen and a cubicle which can be curtained off. Presumed unbuilt. 1932 - Competition Entry for The Insulite Company of Finland's Type House, aka Bio. The assignment involved designing a house of approximately 800-970 square feet fit for winter habitation using insulite board, an insulating material made of sawdust, paper pulp, cotton waste as the main material. 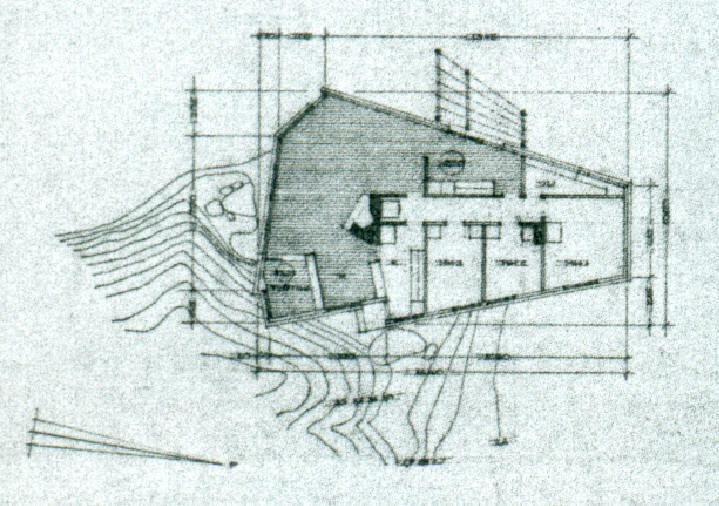 The Aalto Archives contain a large number of sketches for several variant entries, including an overhanging loft inspired by Norwegian mountain huts. 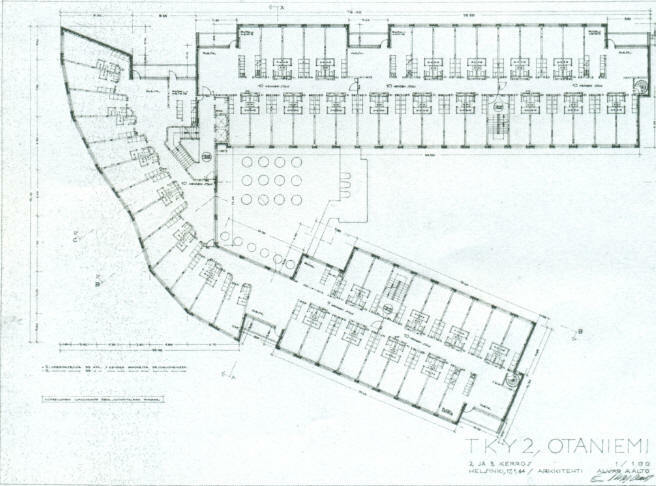 The single-story plan which was sent in was a simple L-shaped box with strip windows and 4 identical cubicles in a row. 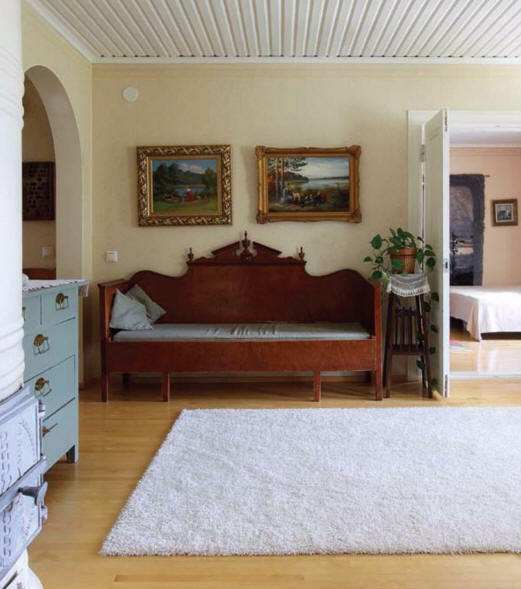 Aalto did not win but his entry was purchased and published in Arkkitehti magazine. 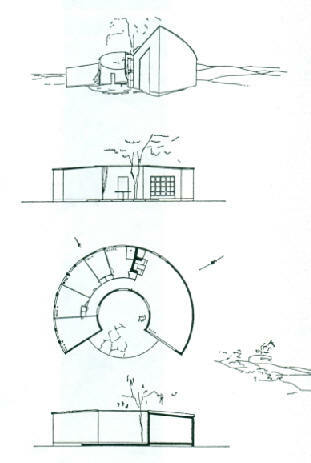 1932 - Competition Entry for Enso-Gutzeit Weekend Cottage. This firm produced hardboard for building, arranged a competition in Spring 1932 for a small holiday cottage of approximately 270-377 square feet and a larger one of approximately 538-645 square feet to be made of the company's "ensonite" board. 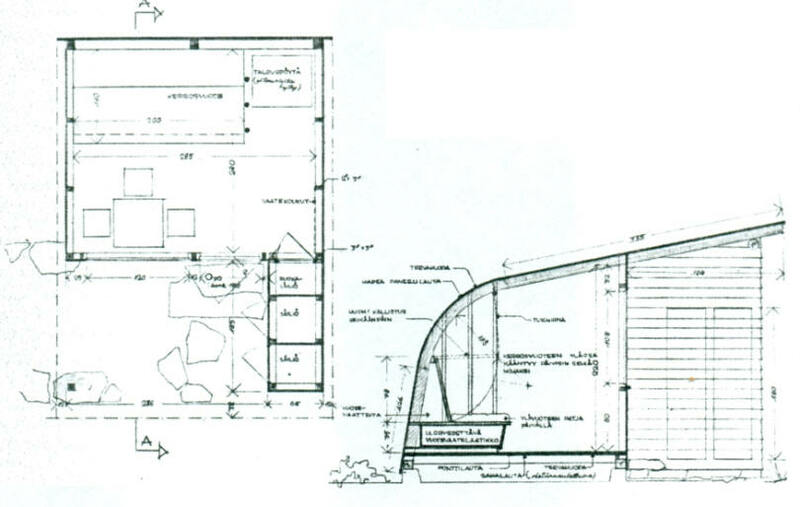 Aalto sent in a highly original entry, 'Tuli', with a fan-shaped plan. 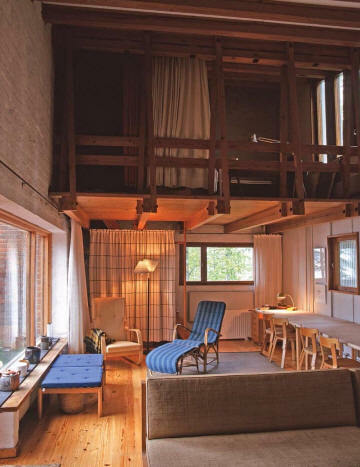 Though it did not win, it was purchased and praised by the jury for its clear, cozy, and practical layout, but criticized for having "too many corners". The drawings were later published in the advertising brochure by the company. 1932 - Villa Temmekann, Fr. R. Kreutzwaldi tn 6, Tartu, Finland. 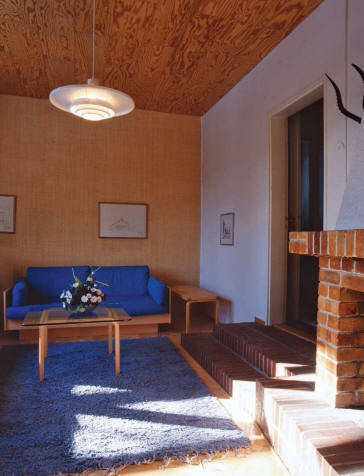 August Tammekann, an Estonian professor of geography, Aalto for a small private house. 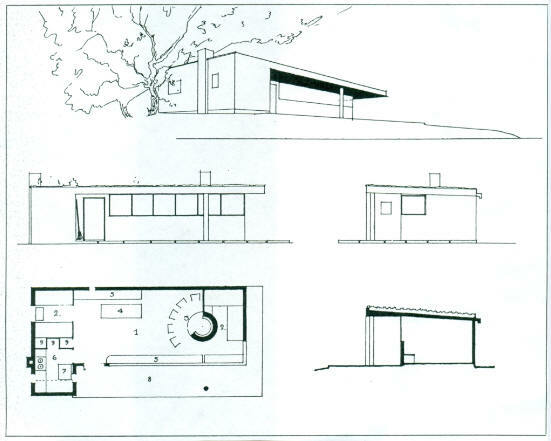 For technical and financial reasons it was finally built in a form (middle photo) which differed considerably from Aalto's design with a hip roof instead a flat roof. 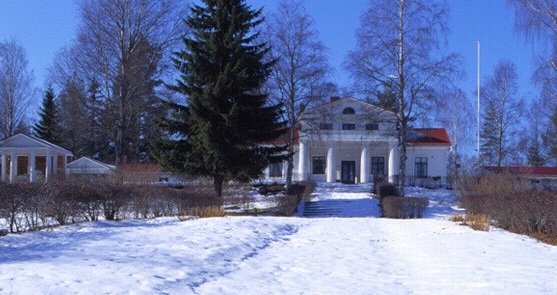 Turku University Foundation purchased the building Tammekann children in 1998. Renovated in 2000 (bottom photo) using the original drawings. 1934 - Physician's Residence for Enzo-Gutzeit, Enso. 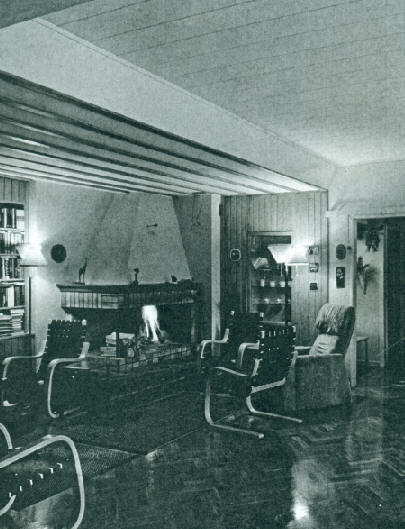 In connection with his exhibition in London in 1933, Aalto came into contact with the Enso-Gutzeit Wood-Processing Company which hoped to boost its exports to Britain with the help of an experimental house designed by Aalto for the Ideal Home Exhibition at the Olympia in London. 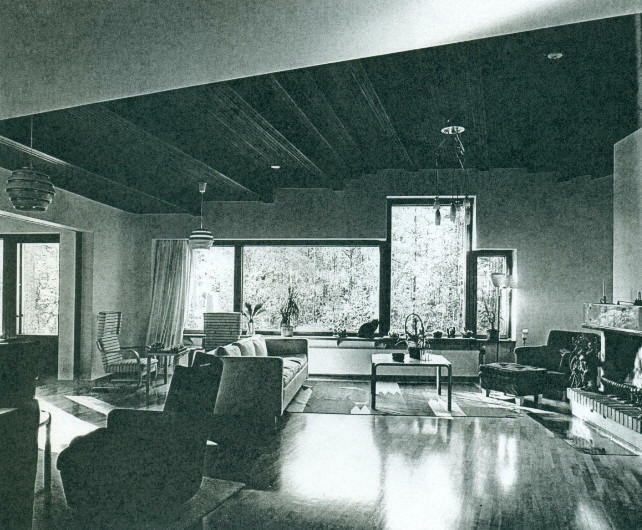 His serious illness at the end of 1934 prevented this project from materializing. 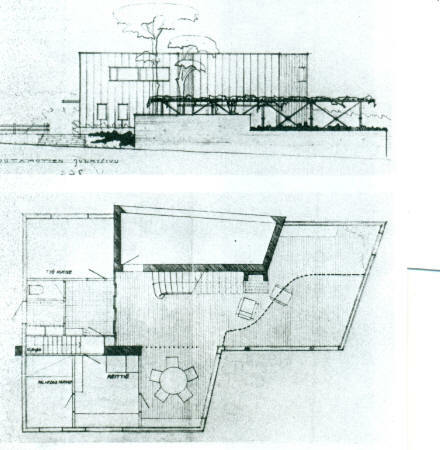 In spring of 1934, however, he designed two type houses for the company to demonstrate how Le Corbusier's domino system could be combined with light interior and exterior walls of Enso bard. The first of these pedagogic projects was a two-story house called a 'physician's residence' which gives the impression of being a rather dull, square 'functional box'. No houses of this type were ever built. 1934 - Home for Enso-Gutzeit Officials, Enso. The project had the same background as the 'physician's residence'. The roof slab of this bungalow is supported by 8 concrete columns and all of the walls are free-standing. 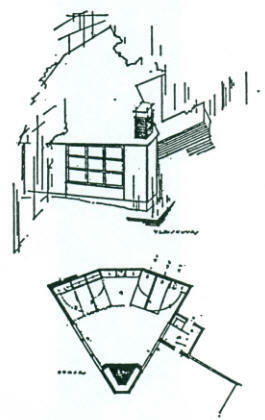 The house contains 4 rooms, a kitchen, a large terrace, and a garage. 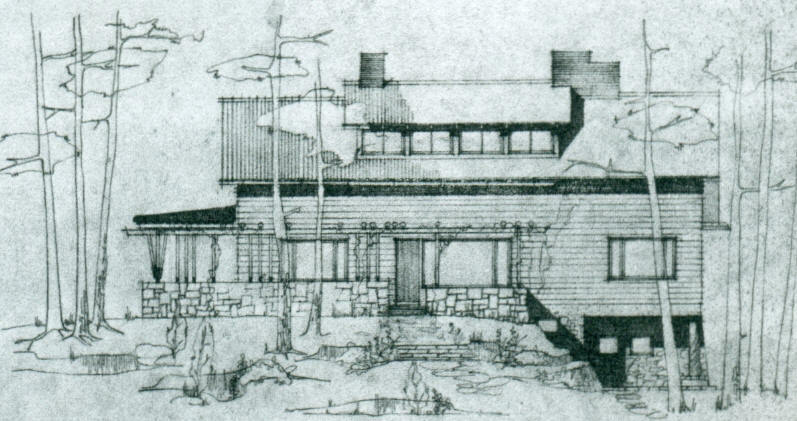 In spite of the uncompromisingly Rationalist idiom, the flat roof and low horizontal lines make the house aesthetically pleasing; however, this house also remained unbuilt. 1934 - High-Rise area for Oy Stenius, Munkkiniemi, Helsinki, Finland. At the end of 1934, Aalto was commissioned to design several residential blocks on the slope above the present site of the Kalastajatorppa restaurant. Striving to maximize the sea view, he placed 4 high blocks in free-fan formation on the plot. The size of the buildings varied from a narrow tower block to a building 200 meters long and 14 stories high, containing over 300 flats behind the monotonous strip windows of the vast facade. This exceptional colossal design, which marked the culmination of Aalto's orthodox Rationalism, attracted favorable notice at the 1939 exhibition "Art in Our Time", at the Museum of Modern Art in New York. It was not built. 1936 - The Alvar and Aino Aalto House, 20 Riihitie, Munkkiniemi, Helsinki, Finland. 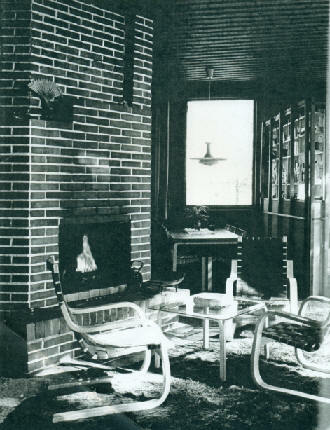 In 1934, Aino and Alvar Aalto acquired the site. Around 1935 - Riviera Housing Company Apartments, Itäinen Puistotie 14 A, Kaivopuisto Park, Helsinki, Finland. This plot now occupied by the U. S. Embassy contains some 20 luxury flats ranging in size from 484 square feet to approximately 1,600 square feet. The plan features a sauna and an open-air terrace with a fountain on the roof. 1936 - The John M. Gylphe Summer House, aka Sonnenblick, Gloskar Island outside Hanko. Unbuilt on account of the war. The L-shaped plan contains a living room with an open fireplace and fixed sofas, a small bedroom, and a miniature kitchen. 1936 - Master Plan of Sunila, an industrial estate. Allto separated the factory from housing by placing it on a rocky island with access from the mainland via a road embankment and with a steep cliff in front of which ocean-going ships could be moored. 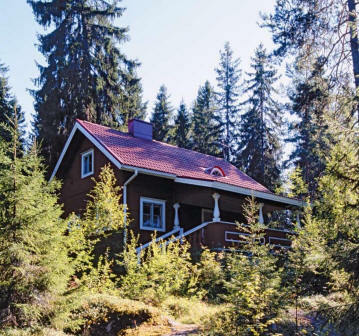 He scattered the housing among the hills on the mainland, creating Finland's first 'forest town', that is, a combination of urban blocks of flats and a forest (or what remained of it). He continued this work in the 1940s and 1950s. 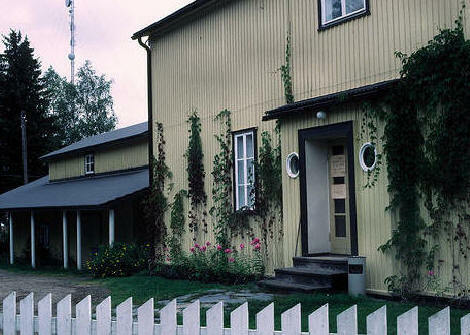 1) The Lauri Kanto House, aka Kantola. He was the Sunila factory manager. 2) Typical worker housing in Sunila, built in 1938. 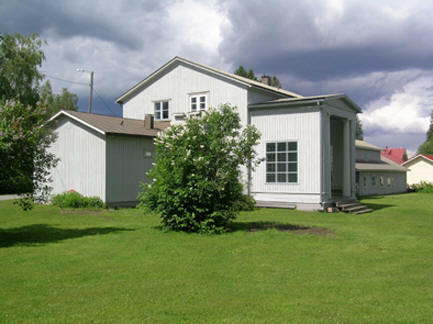 1) Koivikko House, a chain house for factory officials on a plot next to the church. This three-story building is faced with brick and has bearing transverse walls reaching through to the facade, horizontal weatherboarding between the windows producing a strip window effect, and a room disposition providing one three-room and one four-room flat on each landing for each of the three flights of stairs. At one end of the building is an indoor ballgame court. The outbreak of war prevented construction. 2) House on Savantie for lower officials. A two-story chain house with four flights of stairs providing access to two, two-room flats with kitchenette and one studio with kitchen per landing, making a total of 24 apartments. With its flat roof and balonies, the design makes a very modern impression, but the kitchens have wood stoves, though the house is centrally heated. The house was not built. 3) Wooden houses for Savonmaki housing area. The drawings are dated August - November 1937 and marked as "type A1, A3, B2, C, and G". 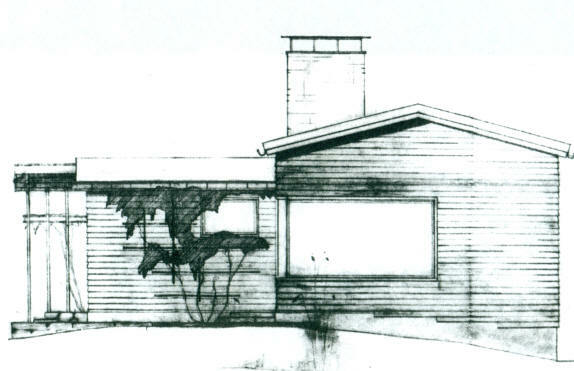 They are evidently prototypes of the "AA House" introduced in the 1940s by the Varkaus house factory. They have an asymmetrical hip roof and feature, a food cellar, porch, large living room, kitchen, two bedrooms, and wood heating, and have neither toilet nor bathroom. Only four such houses seem to have been built in the area. The best-preserved among them is known as the "Alvari of Savonmaki". 4) Allotment Huts for workers wishing to cultivate a small garden patch. The huts consist of one room of just over 75 square feet containing a sofa which can be converted into a bunk bed, a tiny table, 3 chairs, and a cooking recess. In front of this room is a relatively spacious roofed verandah and a tiny larder and shed. 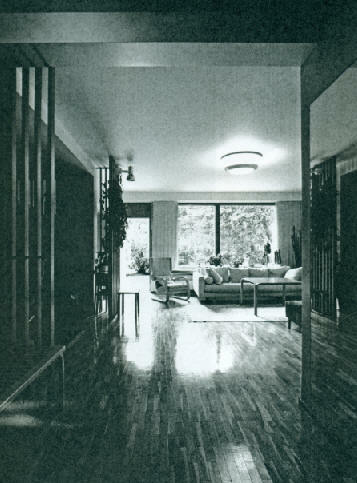 Aalto designed 3 variants in 1939, the most interesting having an arching back wall which merges with the slanted ceiling. 1938 - Staff Housing for Karhula Factory Employees. 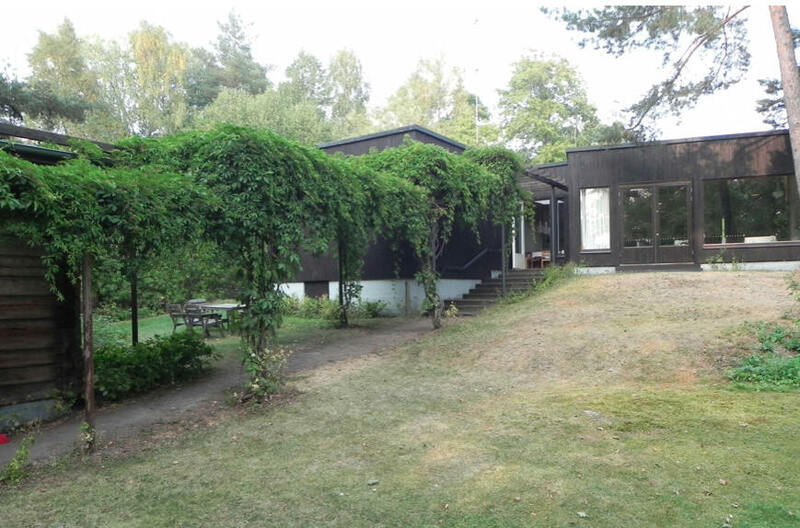 Aalto designed the prefabricated housing built by the construction firm EKA in 1938 to his type drawings (#6 and #7 for Sunila) as well as wooden one-family houses variable in 3 ways, built in the Otsola housing area from 1938 on. Their floor area was approximately 645 square feet, sufficient for an entrance hall, living room, kitchen, 2 bedrooms, and verandah. The toilet was in the large cellar. 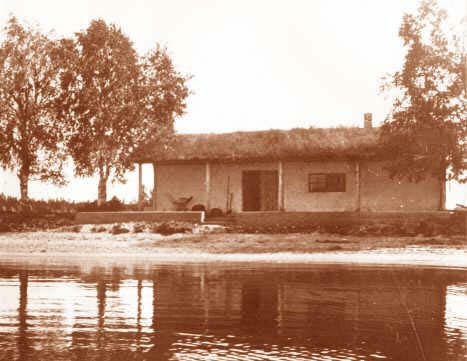 1939 - The Anders Kramer Waterside Retreat, Karhula. Unbuilt. Plans are missing but the project is mentioned in several letters. 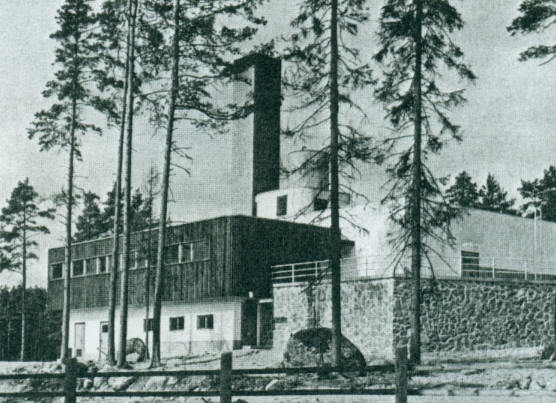 1937 - Staff Housing for Tampella at Inkeroinen Pulp Mill, 1. 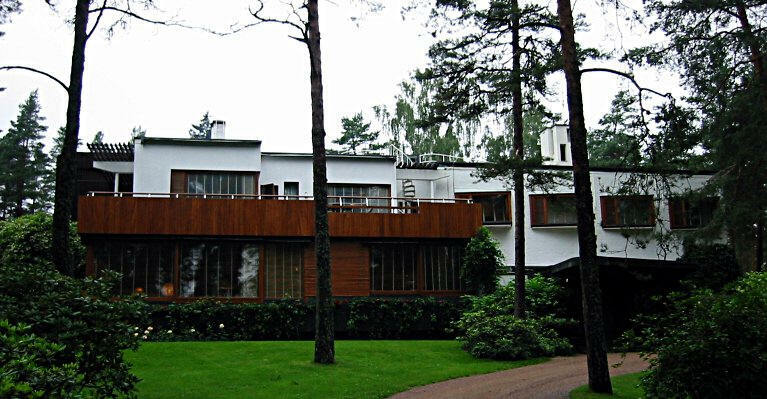 Aalto made extensive alterations to the residence of the local plant manager, which had been designed by Finnish architect Birger Federley in the 1910s. The building is now used as the office of the wood-processing division. 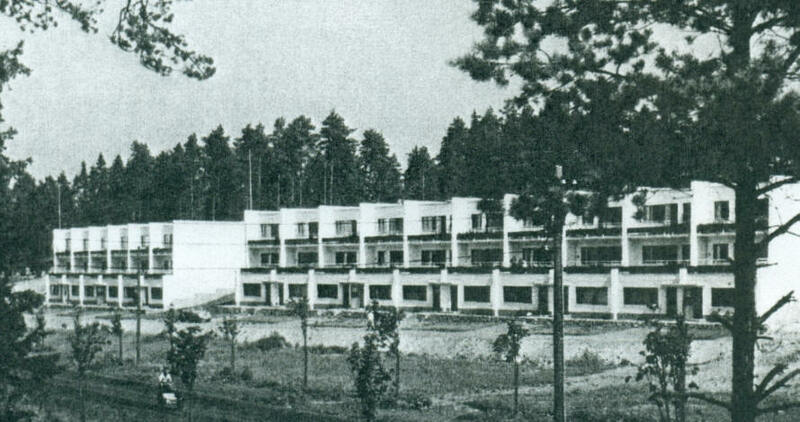 1937 - Staff Housing for Tampella at Inkeroinen Pulp Mill, 2. The Chief Engineers house, designed at the beginning of 1937, is the centermost of 3 similar two-story houses with steep hip roofs of red tile and white rendered brick walls built for the mill engineers. 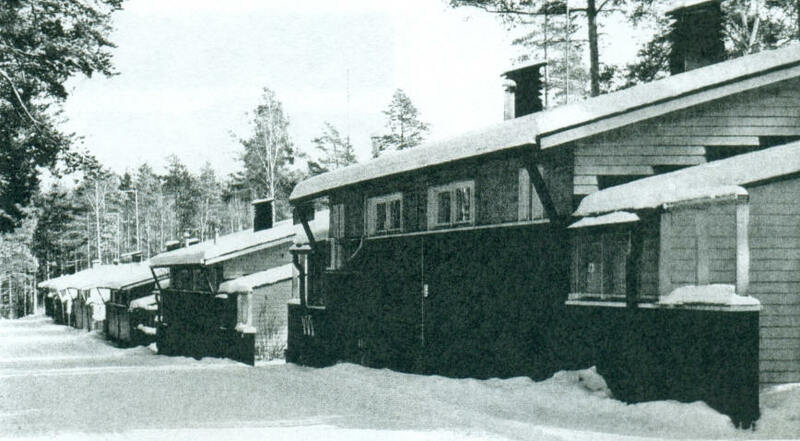 1937 - Staff Housing for Tampella at Inkeroinen Pulp Mill, 3. Two engineers villas, some 650 feet smaller than #2, but with similar room disposition. The 3 houses, overrun by climbing vines, spacious and reminiscent of English country houses, form a stately but idyllic group on the forrested ridge. 1937 - Staff Housing for Tampella at Inkeroinen Pulp Mill, 4. Five houses for foremen, each containing two mirror image apartments with their own entrance, vestibule, living room, dining room, and kitchen below and a hall with a sleeping alcove, bedroom and 'future bathroom' in the upper story, reduced by the steep pitch of the hip roof. These houses, which were built, resemble the above described engineers' residences in style. 1937 - Staff Housing for Tampella at Inkeroinen Pulp Mill, 5. 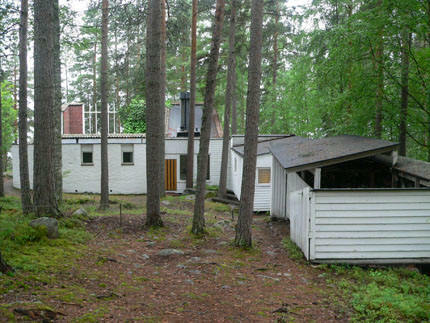 The Jukkala housing area for one-family homes was planned by Aalto in 1937, and a few of his type houses for Savonmaki in Varkaus were built there, but the majority of the houses were buit to the residents' own plans. 1937 - Staff Housing for Tampella at Inkeroinen Pulp Mill, 6. 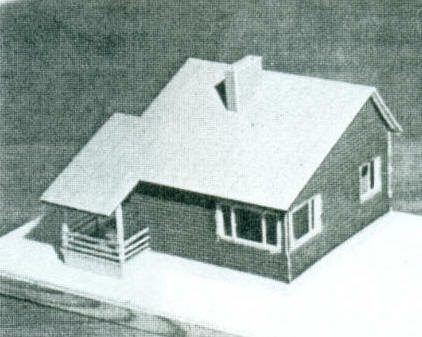 Four two-story workers' housing units of wood, designed in 1937 and built in slightly modified form, each intended for four families, with separate entrance porches to each flat. Half have two rooms and kitchen, the other half one room and kitchen, all of them have their own toilet and runnng water in the kitchen but no bath or shower. The buildings have a common heating plant. 1938 - The Richmond Temple Weekend House. A British hotel owner fell for the Turku archipelago, where he wished to rent the small island of Westerstryskar and build a leisure house. The long benches underneath the windows along three long and narrow tables provide seating for 35 dinner guests and a perfect sea view through the strip windows. A round, open fireplace is placed in front of the windows on the north side, with armchairs in a semicircle for admiring the sunset. The kitchen and servant's room are also on the main floor, while the master of the house and the more fastidious guests have 2 bedrooms and a bathroom at their disposal on the smaller upper story. The flat roof extends over a large verandah. The growing threat of war made the client give up his plans. 1938 - Terrace Housing at Kauttua. Only one built. Commissioned 1937. This was a logical development of the Sunila Housing. 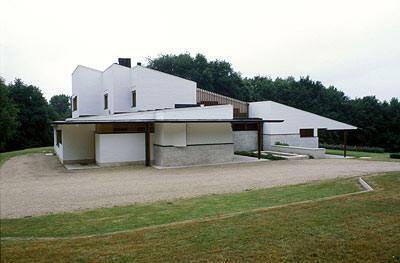 Aalto made use of the sloping ground to give each of four stepped, single-story blocks their own ground level entrance. The master Kauttua plan which included a school at one end and a sports center at the other was abandoned on account of the war. 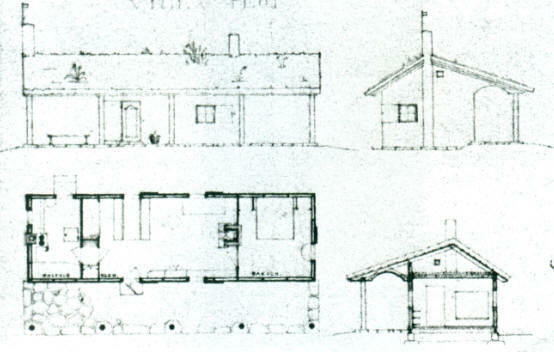 1938 - The Maire and Harry Gullichsen House Plan, aka Villa Mairea, Noormarkku, the site of the Ahlstrom family estate near Pori. 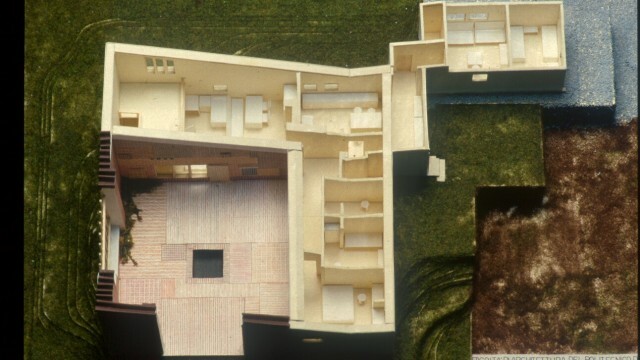 The plan comprises an L-shaped building volume with three stories on the entrance side and two facing the walled garden which contains a sauna and pool. This was the first of several concept plans. Unbuilt. 1938 - The Maire and Harry Gullichsen House Plan, aka Villa Mairea, Noormarkku, the site of the Ahlstrom family estate near Pori. This version is called Proto-Mairea. Unbuilt. 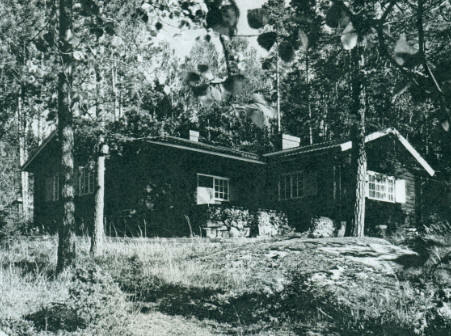 1938 - Engineer H. Rydgren's Summer Cottage, Espoo, Suvisaaristo. Originally consisted of a concrete basement block containing a sauna and a guestroom, and a main story comporising a living room, a small kitchen, and a servants' room, a bedroom, three small sleeping alcoves, and a large verandah. After the war, the cottage was partially rebuilt for year-round use. 1938 - Master Plan for Munkkiniemi, Finland. Aalto continued town planning work for the Stenius Company, which owned large areas of the suburbs of Munkkiniemi, Haaga, and the island of Kuussisaar, near Helsinki. 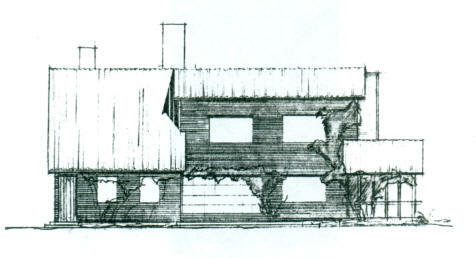 This involved "building for dense settlement" in the area above Kalastajatorppa (Fisherman's Cottage) restaurant, for which he had drawn up a plan in 1935, and which he now completed with a series of low-rise buildings; on ordinary streetside plots he designed freestanding houses of one-, two-, or three-stories, elsewhere he placed pointblocks ("high apartment buildings with the circulation and services in the central core and the residential areas grouped around it on several stories") and chain houses in free formation. The plans were all shelved shortly after when the company sold the land to the city of Helsinki. 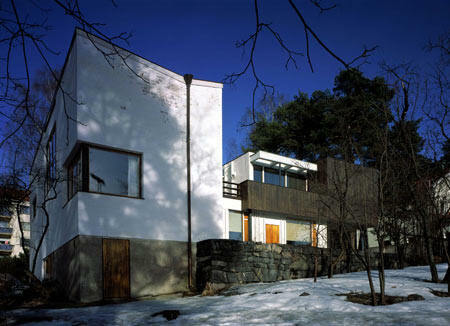 1939 - The Maire and Harry Gullichsen House, aka Villa Mairea, Noormarkhu Finland. Final Version. Commissioned 1937. 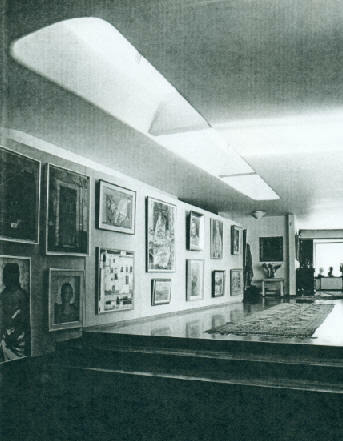 Compared to previous plans, the basement story was deleted and the drawing rooms and art gallery have been combined into one large 'all-purpose' room. The sauna stands at one end of the open courtyard beyond the kidney-shaped swimming pool. 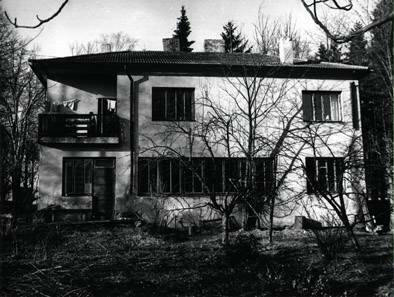 1939 - The Eino Makinens' Residence, Kuutamotie 7, in Kapyla, a Helsinki suburb. Unbuilt. 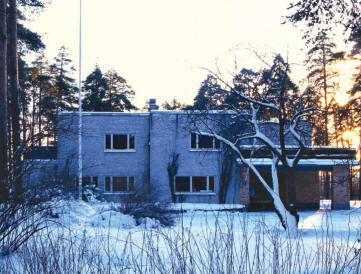 The first version was too expensive, so Aalto reduced the size of the house, shown above. The client still did not build. 1939 - Master Plan for Inkeroinen. The minor district plans started by Aalto in 1937 were incorporated in 1939 in a master plan which he further developed during the 1940s in connection with assignments for Tampella in Inkeroinen. 1940 - HAKA Competition, unbuilt housing development. 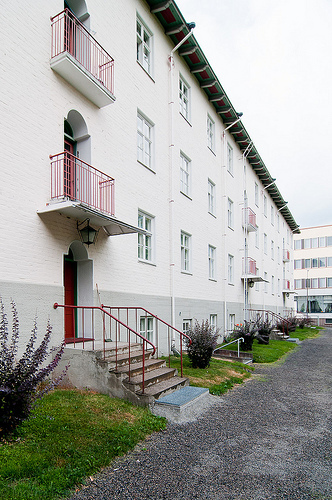 The movement toward modern housing continued in the 1940 Social Democratic Building Society (HAKA) competition where the emphasis was on medium-rise buidings. The HAKA competition was won by Hugo Harmia and Woldemar Baeckman, with Ekelund, Valikangas and Bergstrom coming second. Aalto and Aarne Ervi, who submitted a joint entry, did not place. Aalto's designed informed his later project, Baker Dorm at MIT. 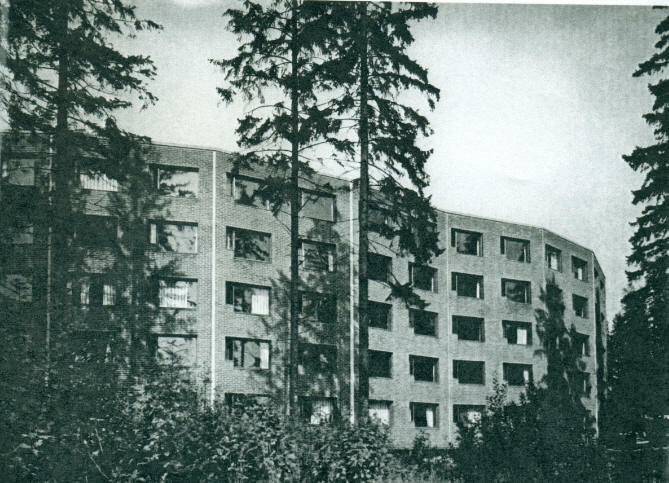 1940 to 1941 - The Aseveli-Kyla Housing for Ex-Service Men (aka Standard Houses), Nekala, Tampere, Finland. Thirteen were eventually built, each with its own garden - a vital requirement for growing food and enabling self-sufficiency during the rationing years. 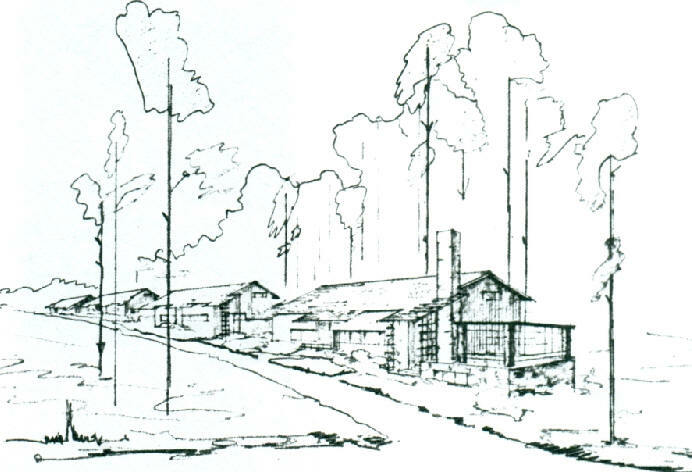 1942 - Master Plan for Karhula, another Ahlstrom Company industrial community. Commissioned 1936. 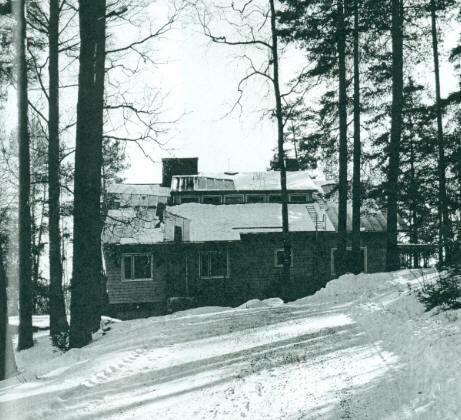 1946 - The Site Managers House, aka Varkaus, aka VOK Standard House, for the A. Ahlstrom Company, Pihlava, Pori, Finland. The VOK houses were more spacious and meant for officials. Designed in 1941, they would be built during the next decade in various industrial areas. Sold. 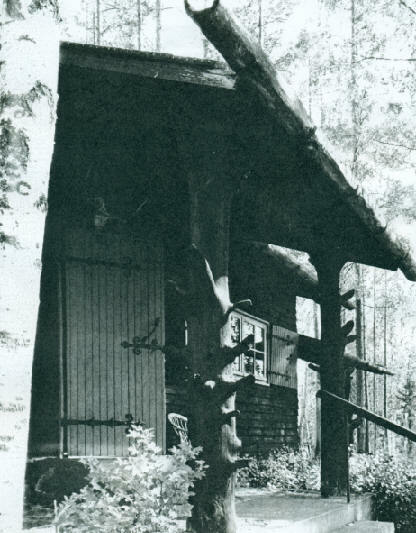 1944 - The Managers House, Yhteissisu Company, Vanaja, Hameenlinna, Finland. 1945 - The Korpikoto Hunting Lodge, Pertunmaa, Finland. Major Jorgen Schauman, Works Manager of the Tampella Factory in Inkeroinen, commissioned it. 1946 - The Heimdal Housing Area, Nynashamn area, Sweden. 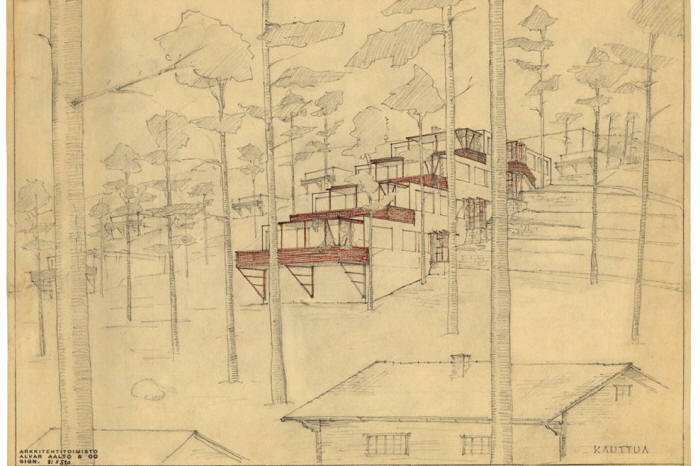 While working on the master plan for Nynashamn (unbuilt), Aalto and Albin Stark designed this housing area with a magnificent view of the sea. 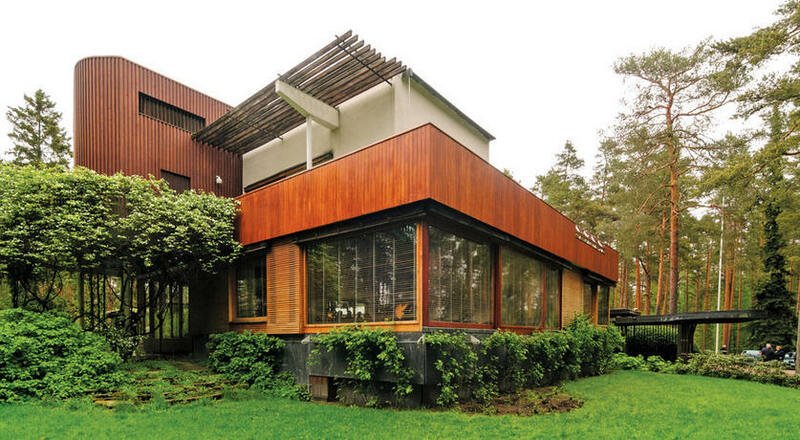 The client asked for simpler plans but Aalto refused to compromise. Eventually built by 1948 but not to the original plan. 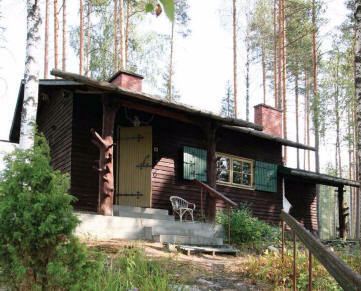 1948 - Villa Kihlman, Kuru, Ylojarvi, Finland. Commissioned 1947. 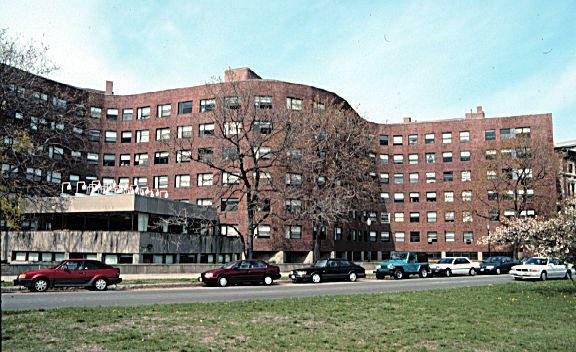 1948 - Baker House Dormitory, MIT, 362 Memorial Drive, Cambridge MA. Commissioned 1947. Baker House was the first dormitory on West Campus and the first with a dining hall. Ground was broken in October 1947. Named for Everett Moore Baker, MIT Dean of Students. Designed so that 90% of the rooms have a river and skyline view. 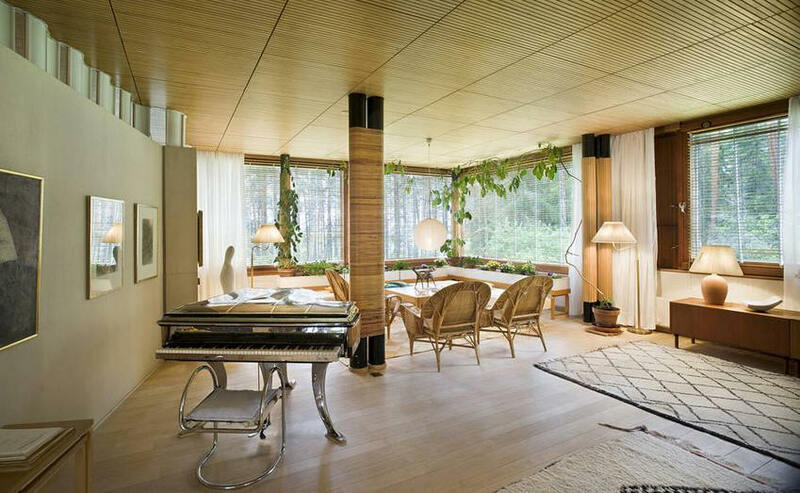 The rooms range from 105 - 445 square feet and all furniture was designed by Aalto. Several renovations over the years were completed without harming Aalto's design, including window replacement, renovation of mechanical systems, and updates for students with special needs. 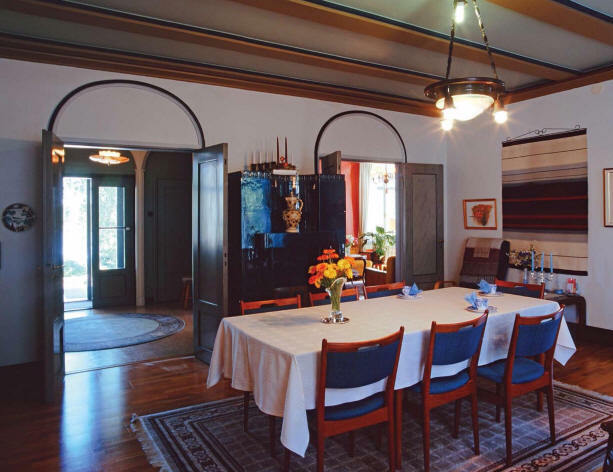 A restoration of the birch furnishings was completed in 1998. Website. This is one of only two Aalto buildings in the US, the other being the Mount Angel Library in Oregon. 1952-54 - The National Pensions Institute Housing, Helsinki Finland. 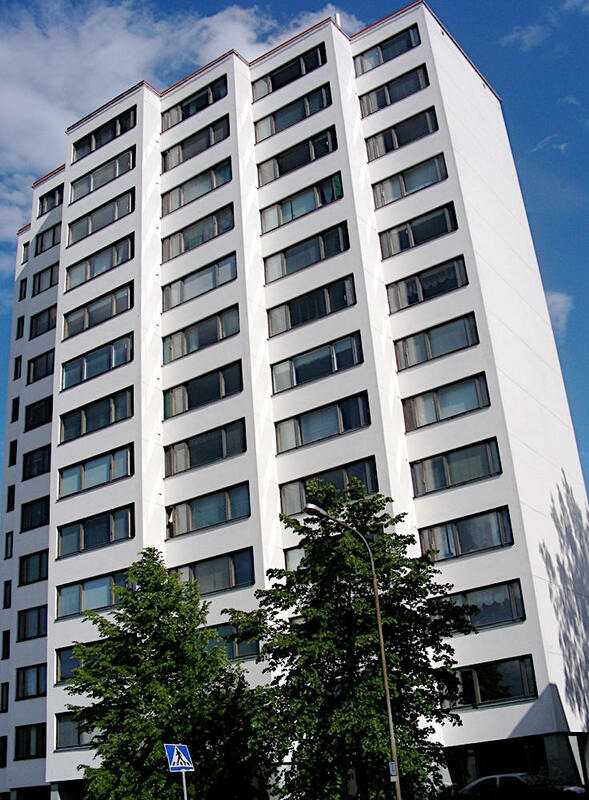 Aalto designed these blocks of flats in Munkkiniemi Helsinki for the employees of the Social Institution of Finland. Seen in the cityscape the redbrick high-rise blocks form an integrated whole. Photo 3 shows the loft floor which is intended to be used differently from the residential floors and this is reflected in the different brick-overlap patter in the facade. Last photo is Alvar Aalto skiing on the grounds of the apartments. 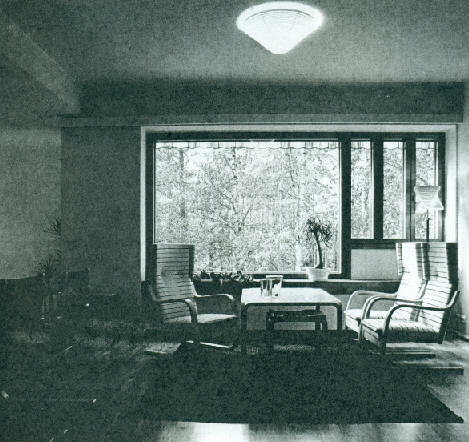 1952 - The Eero Aalto House, aka Villa Manner, Sundby, Porvoo, Finland. Commissioned 1951. 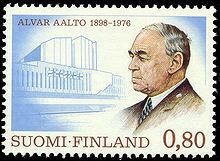 The client was Aalto's 2nd cousin Eero, a justice of the Superior Court. 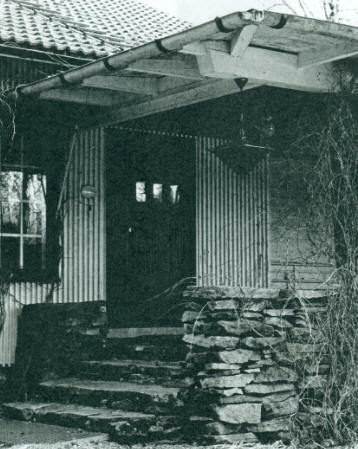 1952 - The Alvar and Elissa Aalto Summer House, aka the Muuratsalo Experimental House, Melalammentie 2, Muuratsalo, 40900 Jyvaskyla, Finland. Designed for his new wife Elissa, married after Aino passed away in 1949. It was conceived as an experimental laboratory to test construction and architecture philosophies with views out to Lake Paijanne. The 3 surrounding enclosures of the courtyard serve as screen, living rooms, and bedrooms. In the middle of the courtyard stands a fire pit. The inner courtyard walls show over 50 different types of brick arranged in countless patterns. 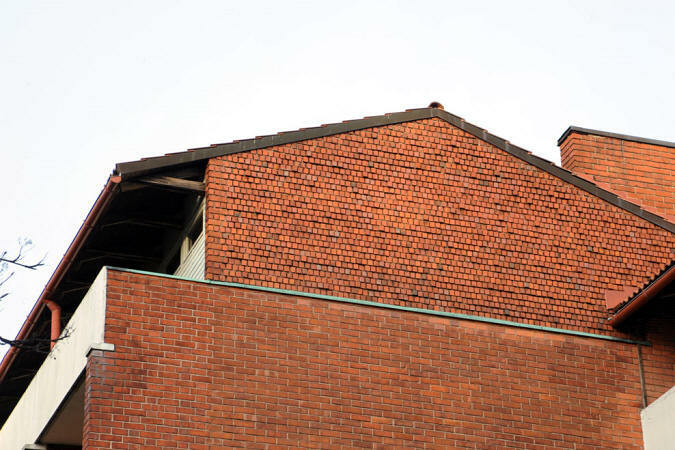 The bricks are placed not only to test their aesthetic values, but also to gauge how they hold up in Finland's harsh climate. 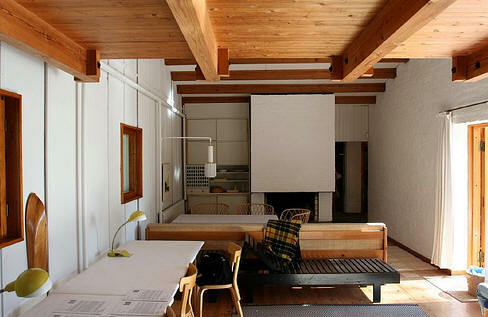 Inside a raised loft area held in tension by large wooden beams was used as a painting studio. Included in the surrounding property are Aalto's boat, bottom photo, which he designed in 1954, and a boat enclosure designed by two students from Denmark in 1996. 1) The managers residence, also known as the "A Building, with its own beach and landing-stage. It contains some 15 rooms, kitchen facilities, terraces, and balconies. The exterior is characterized by rendered white walls, a flat roof and a cold Functionalist style, but certain accents such as wood paneling soften the overall impression. 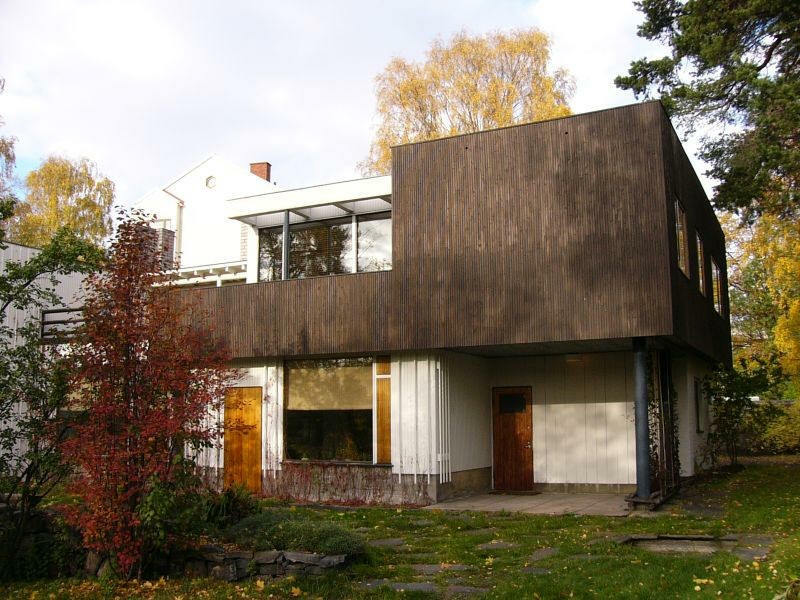 Aalto also designed a less pretentious variant more coherent than the version actually built. 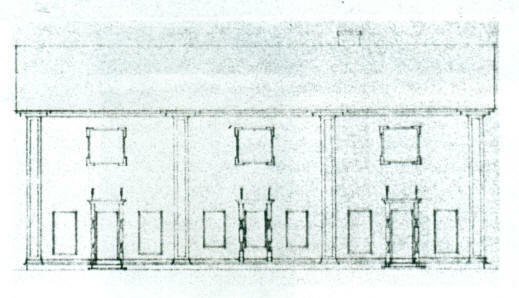 2) Row house for Engineering Staff, known as the "B Building", consisting of 5 linked two-story units with white rendering, which splays out slightly into the garden in front by virtue of the diagonal placing of the party walls. The slight indenting increases the effect of mutual isolation, which is further enhanced by screening vegetation. These houses are by far the most original and successful at Sunila. 3) Chain house for Foremen or "D Building", consisting of 14 white rendered two-story units laid in a row on a slope, giving them a hint of a stair form. 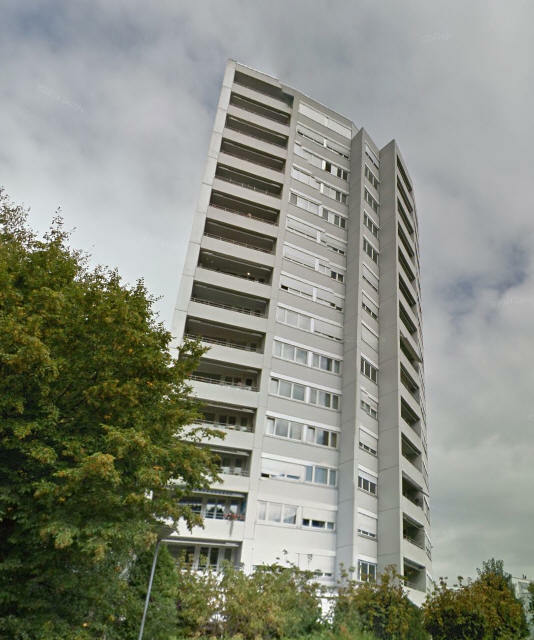 The flats contain a kitchen and living room on ground floor and 2 bedrooms and bathroom upstairs, but no balconies. 4) Chain House for Workers, consisting of two-story rows similar to the preceding building, but with a strip window along the front and two, two-room flats plus one studio flat for each flight of stairs, no balconies. 5) 13 standard wooden houses were built in the Puistolan housing area. 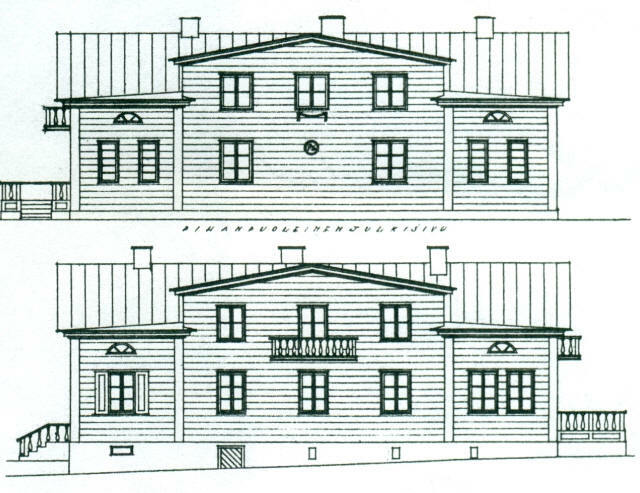 These resemble the earliest single-family houses in Varkaus. 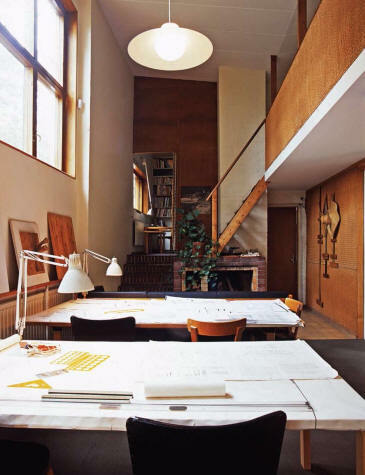 6) Three-story house, a variant of #5; it has the same room disposition, but Aalto lifted each flat with a balcony, which was so small, however, that residents hardly used it. When he designed new housing for a third enlargement in 1951, he corrected this error. 7) Three-story housing known as "type house ROT", with two small flats (living room, tiny bedroom, and kitchen, totaling 420 square feet) on each floor. The sloping plot made it possible to give the flats on the two lower stories their own ground-level entrances at the front and back, while the top story is reached by a low stairway from the back. The ground floor flats have garden patches facing south in front of the entrance, while the upper levels have spacious stepped balconies also facing south. In 1938 and 1939, the EKA (South Kymi Housing) Company built 75 flats in Sunila, 63 in Karhula, and another sixty-odd in the village of Halla to the plans for this type house and variants of the three-story house, #6. 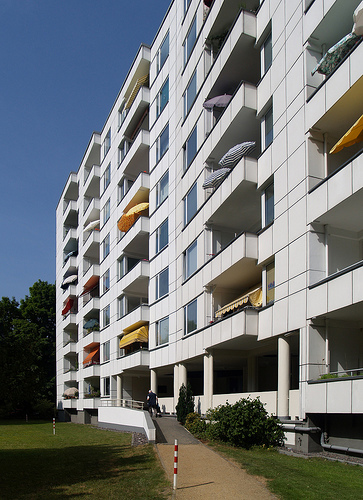 1957 - Hansaviertel Block Apartments, Klopstockstrabe 10, 10555 Berlin, Germany. Commissioned 1954. Constructed as part of the 1957 Berlin International Building Exhibition (Interbau) along with projects by Le Corbusier and Mies van der Rohe. 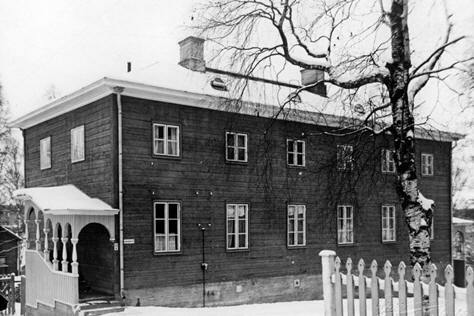 1956 - The Jaako Lehmus House, aka Villa Lehmus, aka Site Manager's House, Typpi Company, Oulu, Finland. Commissioned 1955. Engineer Jaako Lehmus was a pioneer of the Finnish nitrogen industry. 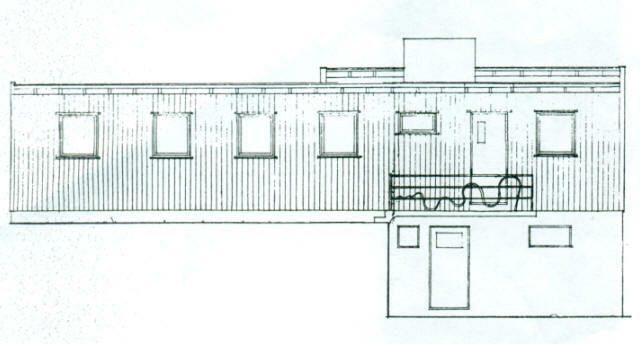 Located on a site close to the riverbank, the two-story building is a compact, squarish volume flanked by a detached one-story sauna and garage wing. 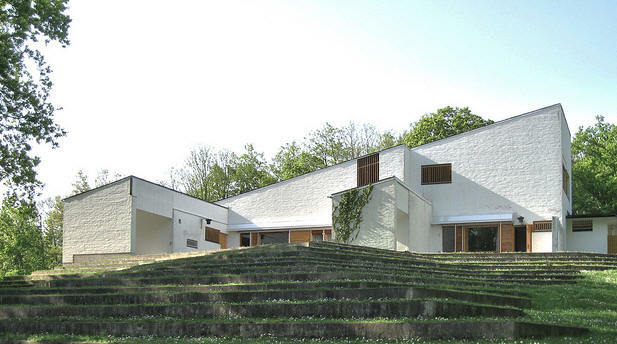 1959 - The Louis and Olga Carre House, aka Maison Louis and Olga Carre, Haute Vallée de Chevreuse Natural Regional Park, 2 Chemin du Saint-Sacrement, Bazoches-sur-Guyonnes, France. Access is concealed behind the walls intended for displaying art work in the entrance hall. 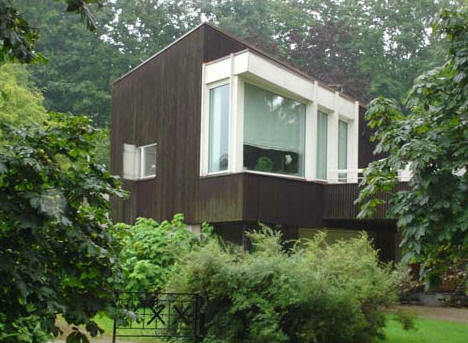 After Louis' death in 1977 Olga Carre closed the house to outsiders. The home was honored as an important building in France in 1996. After she died, her family sold it 2002. 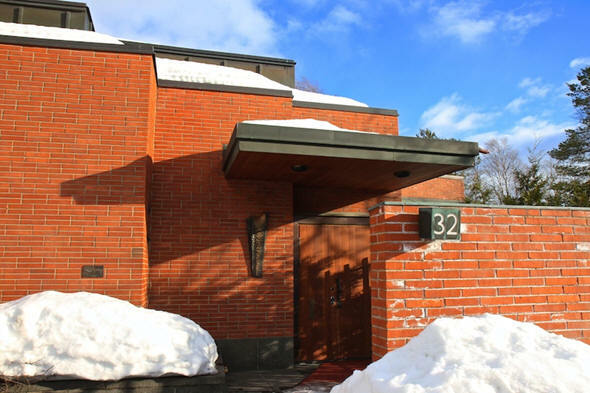 Owned as of 2012 by Association Alvar Aalto; open to the public for tours. Website. 1960 - The Korkalovaara Apartment Buildings, Rovaniemi, Finland. Commissioned 1958 (Rakovalka Block 1958-59, Poroelo Building 1960). 1960 - Semi-Detached Houses for the Enso-Gutzeit Company, Summa Hamina, Finland. William Lehtinen, general manager, commissioned this in the 1950's. 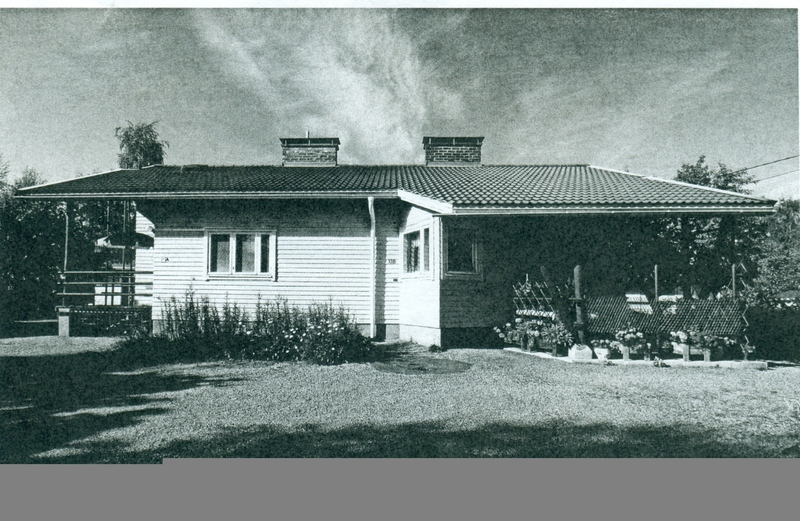 1960 - Engineer's Housing, aka Site Engineer's House, Enso-Gutzeit Company, Summa Hamina, Finland. Commissioned 1959. 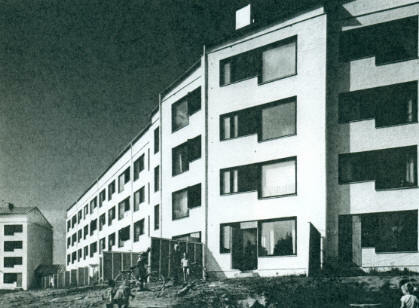 1961 - Housing and Building Complex, Sundh Center, Avesta, Sweden. Commissioned 1955. Ernst Sundh commissioned a plan from Aalto for a residential and commercial building to be built on a triangular-shaped site. 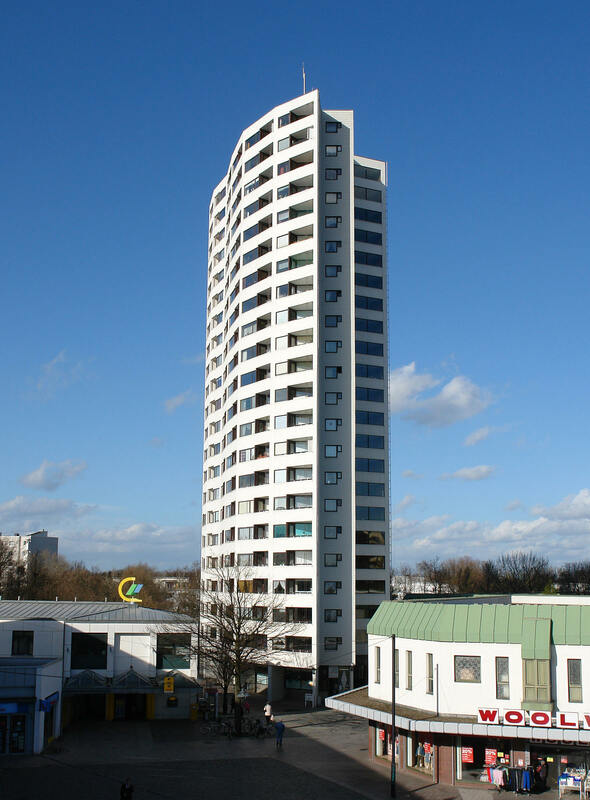 The complex is dominated by an eight-story tower block with a steep mono-pitched roof. The other two wings are three stories. 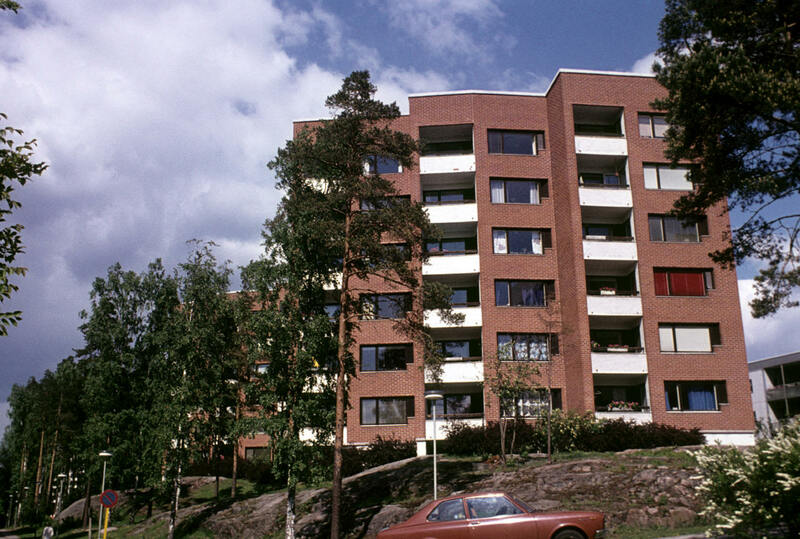 1962 - The Viitatorni Aparment Block, aka the Tusk, Viitaniementie 16, Jyväskylä, Finland. Commissioned 1957. The 13-story building contains 72 units, one-room flats grouped in the middle and three-room flats at the sides. 1962 - The Neue Vahr Apartment Building, aka Flats at Bremen, Bremen, Germany. Commissioned 1958. The 22-story apartment building consists of one- and two-room apartments all wedge-shaped in a fan oriented westwards. 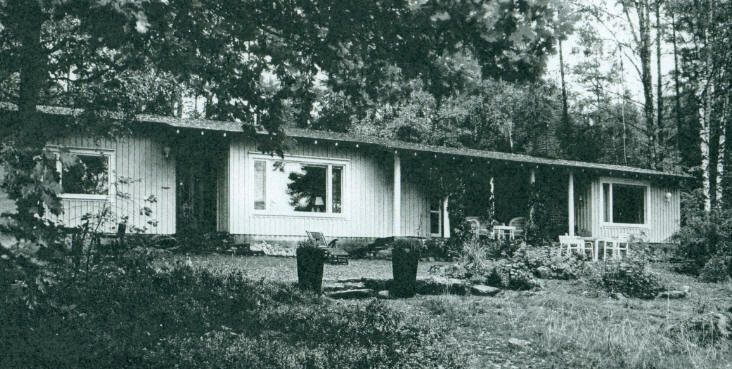 1964 - Site Manager's House, Enso-Gutzeit Company, Summa Hamina, Finland. Commissioned 1959. Has a slightly fan-shaped plan. The pitched roof folds to an almost concave form on the rear of the house. 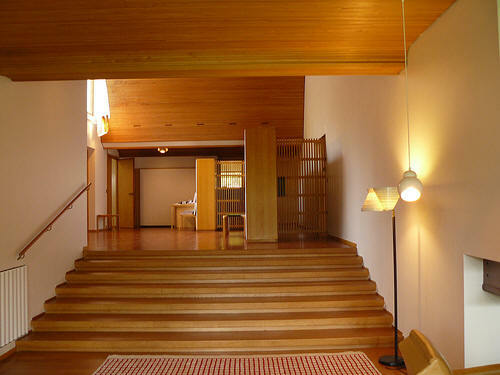 The main entrance is reached from the side, with the living room opening at a ninety-degree angle, another familiar element of Aalto's houses. 1967 - Apartment House, Harjuviita, Finland. The balconies are 'atriums' recessed into the body of the building. 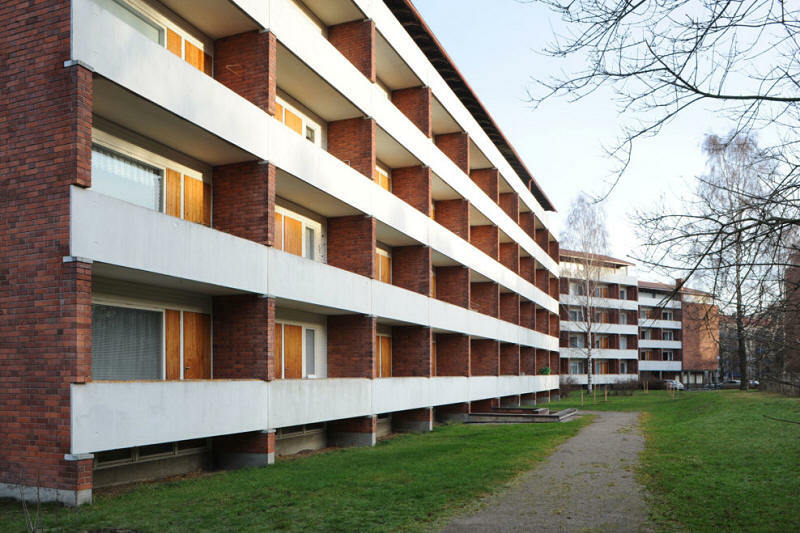 There are ovbious similarities between the Tapiola apartment blocks and those planned but not built for the HAKA Competition in 1940 and the Heimdal district in Nynashamn State, also unrealized. 1966 - Student Housing, Helsinki University of Technology, Otaniemi, Jämeräntaival 1, Espoo, Finland. A competition for the design of the university campus was arranged in 1949 which Aino and Alvar Aalto won. 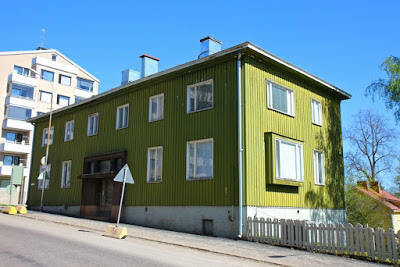 This building type was indeed implemented in the 1950s but by architects Heikki Siren and Martti Mela Kari. 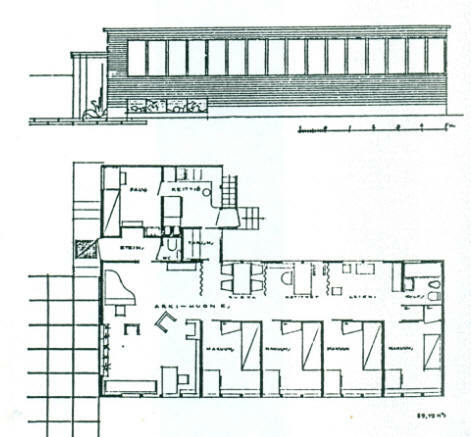 In 1962 Aalto made a new plan for a four-story student dorm, a unit of cells linked together. The plan was carried out in a reduced and adapted form. 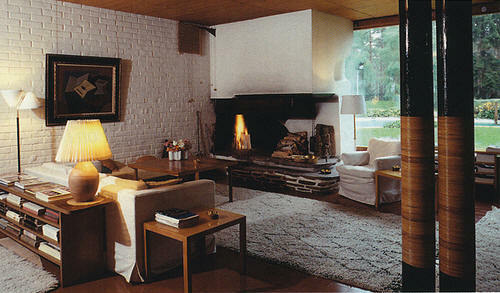 1965 - The Aarne and Hilda Aho House, aka Maison Aho, Rovaniemi, Finland. 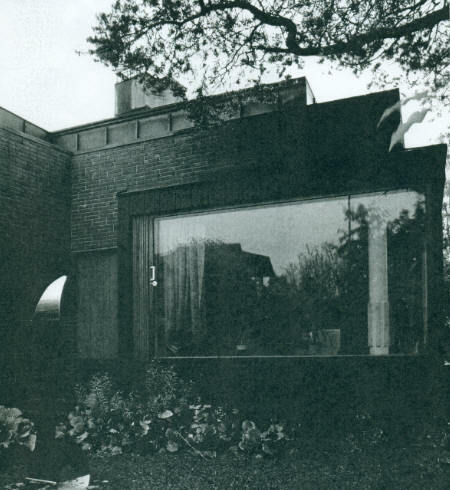 In 1964 when Aalto was working on a library project for the town, Hilda wrote to him to ask if he would design a small two-family house for the couple. The entranceway from the street is hidden behind a red brick wall. 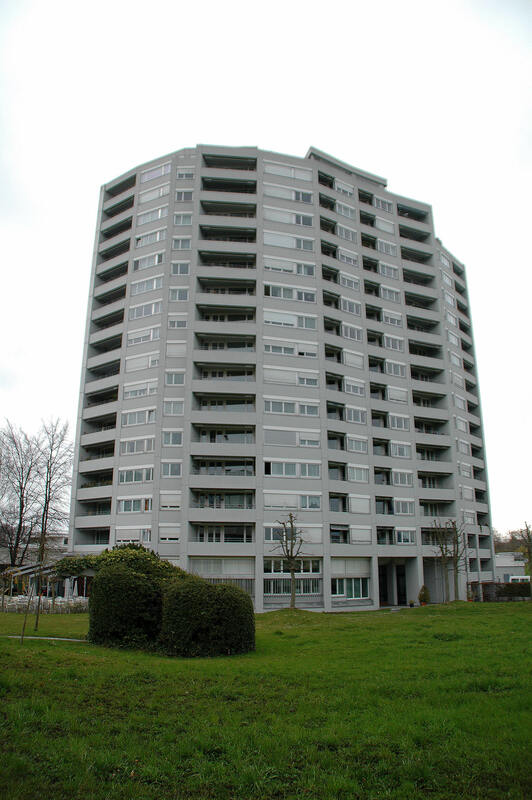 1968 - The Schonbuhl Apartments, aka Flats at Lucerne, 25 Langensandstrasse. Lucerne, Switzerland. Commissioned 1966. 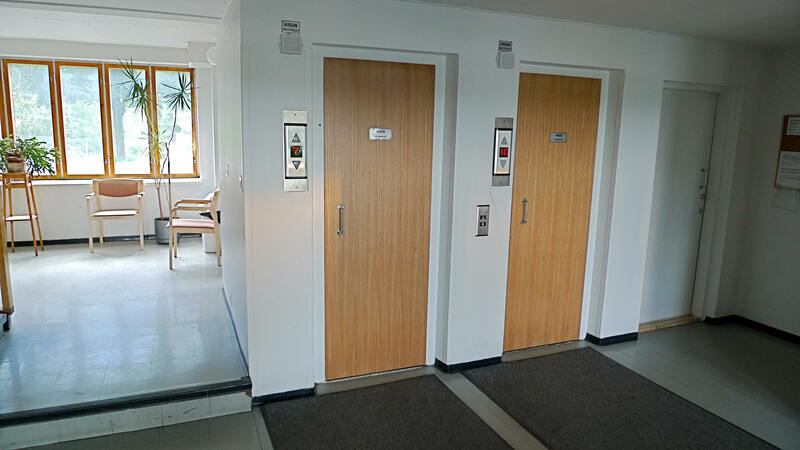 All the apartments are served by a common staircase and one group of lifts, with the individual entrances radiating off a hallway or service area at each level. 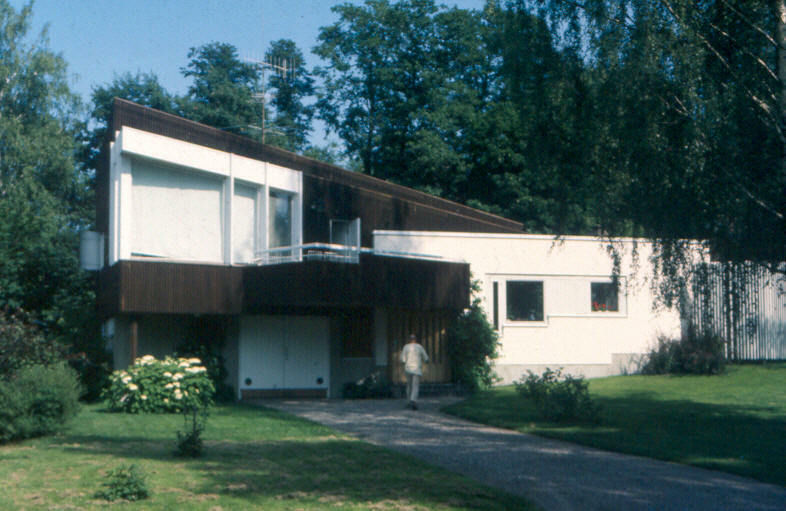 1969 - Villa Joonas Kokkonen, Tuulimyllyntie 5, Lake Tuusula, Jarvenpaa, Finland. Converted to a museum and used for live performances. 1970 - Villa Skeppet, aka The Ship, aka Villa Goran Schildt, Tammisaar, Finland. Commissioned 1969. 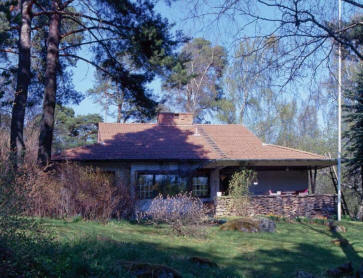 1974 - Oksala Summer Cottage, aka Villa Paivo Oksala, Korpilahti, Finland. 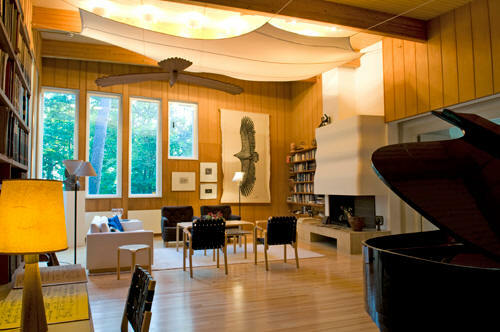 Located on an island on Lake Paijanne. Commissioned 1964. He also designed the furniture and lamps. Sources include: Wikipedia, Alvar Aalto: The Early Years (1919-1927) by Goran Schildt; Alvar Aalto: The Decisive Years (1928-1939) by Goran Schildt;Alvar Aalto: Through the Eyes of Shigeru Ban, by Shigeru Ban; Alvar Aalto Guide by Michael Trencher; "Alvar Aalto and the Aura of Building" site Alvar Aalto; Alvar Aalto by Karl Fleig; Finnish Architecture and the Modernist Tradition by Malcolm Quantrill.